I occasionally write articles for magazines and/or gallery essays, some of them are collected here all in one place. Some Thoughts on Tea (and its Bowls). Having flirted with tea, its implements and bowls. It’s mindfulness and even drinking the stuff. I have come to the conclusion that a best part of my life has been spent preparing myself to realize that I no longer know what I once thought I did. I was brought up in a loosely buddhist/Quaker household, none of my family were official ‘joiners’, just committed practitioners in their own way, on their own terms and in their own time. Growing up in this milieu, with these parents, at that time. I was no stranger to the concepts of ‘zen Buddhism’ and ‘the tea ceremony’. Tea Ceremony was never practiced in my home. After all, we were British! And it was the Fifties. There never seemed any need to practice it. It was however, often discussed, but only as a side issue to meditation and mindfulness, as was yoga, ‘the breath’ and growing organic food. Nurtured in this environment, I was probably the only 7 year old in my primary school class who knew the whereabouts of the Dalai Lama, or even what the words meant. So it should be no surprise that my first pot in 1959 was an interpretation of a Tibetan butter lamp. It’s amazing what kids pick up from parents conversations. Not that I knew much about Tibet, or Tibetan butter lamps, but it is quite interesting to me on reflection, that this is what I chose to make, sitting in the gutter of the dirt road in front of where we lived and picking out fresh wet clay from the gutter after a rain storm to make pots. My mother kept that pot all her life and after her death, I found it in one of her wardrobes, wrapped in cotton wool and boxed to keep it protected. I remembered making it straight away. It took me right back there to that place and time and so it came back to me and I still have it. My ceramic Madeleine. In this family setting it was not the pot that was important, Objects were not valued above experience, however, it was the activity of its making and the effect it would have on the people who used the pot which was up for discussion. Reflecting on my relationship with tea and it’s ceremony, I realise now that the tea isn’t actually necessary and for that matter, neither is the bowl. It’s the state of mind that is realised through the mindfulness process, the bowls and utensils are optional. They should never be more important than the breathing or the listening. The sensing of the environment. The actualization of being there. However, the bowls can be exquisitely beautiful objects in their own right and so I find a place for them in my processes. Beautiful handmade objects are always nice to have in your life, but it is mindfulness that is the key. I’ve come to feel that stringent ritual can be a distraction. Tactile engagement is stimulating and variety can help clarity, but competence takes time. I haven’t engaged with the repetition and ritual. The hardest part for me is to make the time for what is important. It takes time to clear the mind. A beautiful bowl can be a point of entry and the warmth of a beverage can be comforting, but somehow, the stimulation of the tea may not always be beneficial, in the long run it might even be a hindrance. I try to be mindful and I continue to attempt to make these beautiful objects of contemplation. These characterful bowls. I make them as interesting, gorgeous and tactile as my skills allow and I breathe as much life into them as I am able. Their conceptualizing, planning and realization occupy a major part of my life and in the end, although they are not at all necessary. I find them so intriguing and rewarding and I do love to use them. Australian potter Steve Harrison reflects on creativity, materiality and process. It seems that I spend a lot of my time oscillating between many things; the fountain pen and key board, between parchment and paper, between laser and lamy, between sink and stove, wedging and wheel, shovel and pick, ball mill and crusher, chain saw and chisel. There is a dialectic apparent here, between new and old, thinking and doing, play and profit, process and product, making and material. I like the process of creating things, especially in clay, it gives me a thrill to spend a day fiddling around and at the end coming up with something that is mine. I like the feel of things, of all sorts of things like polished stainless steel, planed wood, soft clay, rare steak, curd cheese, fine paper, a porcelain bowl, a soft breast. There are so many sensations and experiences that feed into what makes us what we are and what we can learn about our world. I choose to work in ceramics with a tactile material like clay that is soft, plastic and that feels ’good’, enticing and engaging. I also found that I have had to steel myself to work with other materials that aren’t as engaging to the touch, so as to earn the money I need to support my ceramic ‘habit’. Even though I can’t make a living from exhibiting my work. I decided long ago that I would not take a full time teaching position in ceramics. I prefer to be self-employed, although it lacks security, it gives me the flexibility to try my hand at many things. Working with metal is not as tactile and attractive to me as clay. Metal can be cold, hard and sharp, and working with it is noisy, even dangerous, but the process can be rewarding at one level, not just because of the money it earns, but because of what I can create. 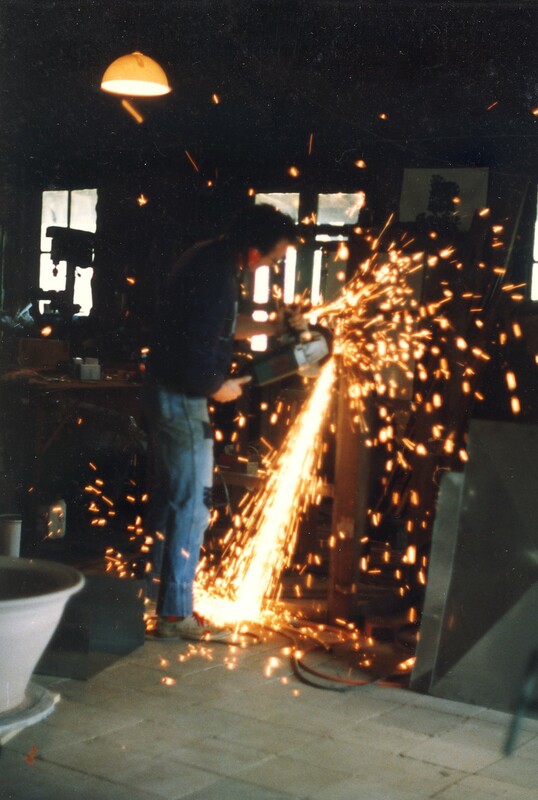 Angle-grinding and welding are examples of useful productive processes which are not particularly enjoyable, certainly not in the way that clay is. 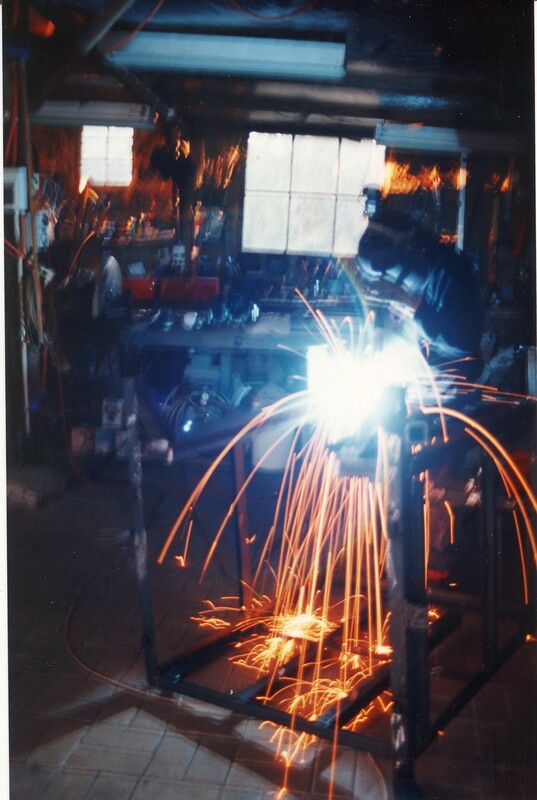 The closest that welding can come to being enjoyable must be TIG welding. It is of course necessary to wear leather gloves just like any other welding process, but the gloves are of very fine, soft leather, as the technique requires very fine motor skills. It is in this sense that it comes closest to ceramics. I am not a good TIG welder, as I don’t get to do enough of it, although as far as welding goes, I quite enjoy the process, even from with-in the OH&S cocoon of face shield and gloves, because the finished welds can be so beautiful. At the end of the day I can stand back and take pride in a beautiful job, well done. 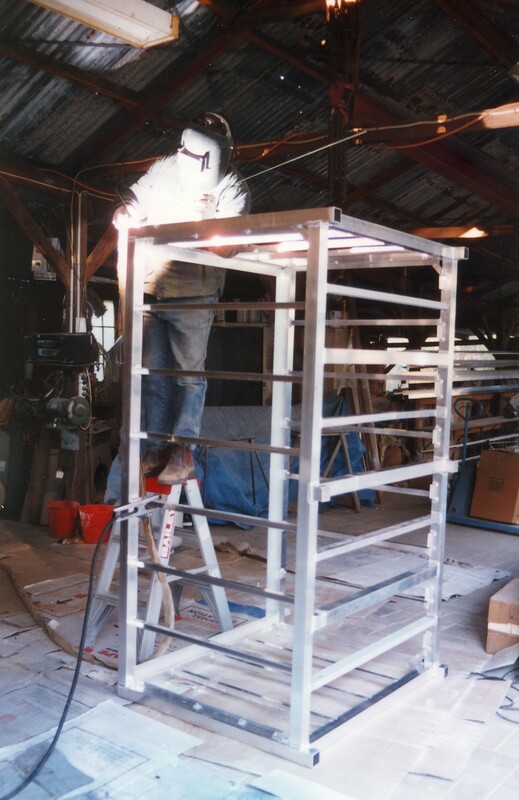 When I built my first kiln, there was such interest in it from friends and acquaintances and then total strangers, such that soon I was forced to build a kiln building factory. I built my factory (symbolically) from clay, mud bricks and recycled materials. My factory isn’t the nicest place to work, but it is better than working somewhere else for a boss. The great benefit is that I get to own the ‘toy shop’ with all those tools and machines to use creatively after work-time is over and play-time begins. 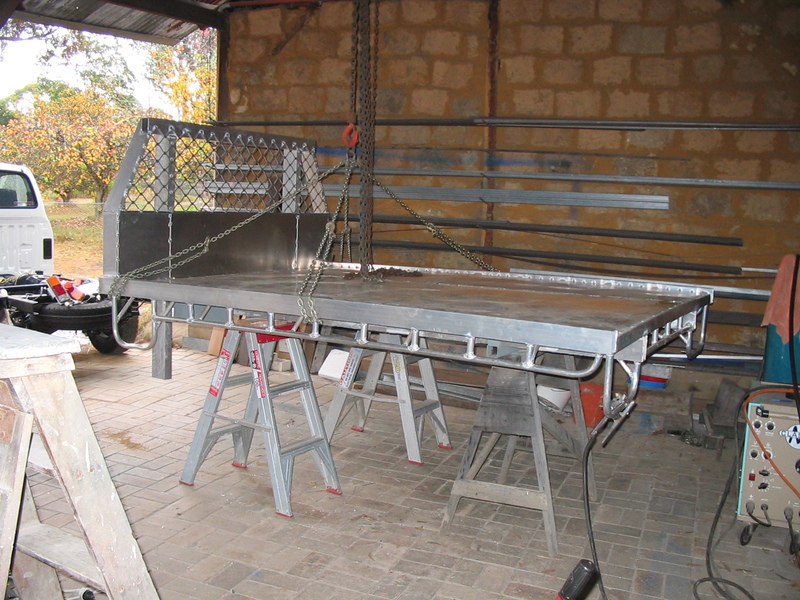 A good example of this productive play is that I have been fortunate enough to be able to build my own truck body from scrap aluminium at next to no cost, and a sturdier unit would be hard to find, and certainly unaffordable if I could find one. Fig. 7. 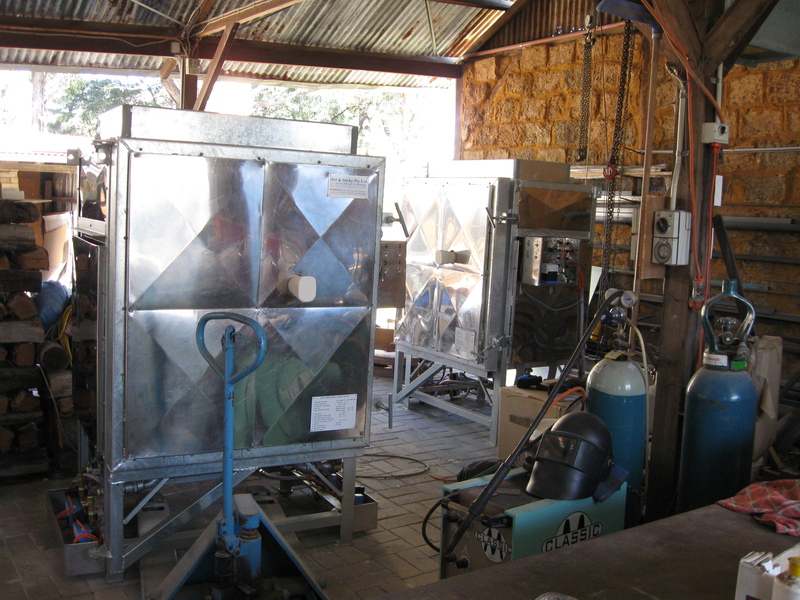 Stainless steel kilns in my factory. Quite often I like the smell as well as the tactile sensations of work. I certainly don’t enjoy the smell of the angle grinder or welding, but on the other hand, wet clay, freshly cut wood – especially cedar, cypress and eucalypt, fresh soil, baked bread, brewed coffee, freshly mown wild rocket/arugula that self seeded in the lawn, also garlic chives or cilantro/coriander are a surprise and a wonder when they burst forth from the mown hay and envelop the senses. Likewise, I like the smell of the garden after rain, salt sea spray on the wind, even that odd ozone-like smell of a mechanical digger scraping hardened steel over sandstone rock. Very odd I know, but strangely engaging and very memorable, and of course there is the special old fashioned smell of refilling a fountain pen with blue ink. In particular for me there is that peculiarly nostalgic smell of lighting a kindling fire of eucalypt leaves and twigs. When I light my wood fired kiln or the kitchen stove, which we do almost every day, I never tire of it, it’s like new life each time, setting the fire is like preparing the board for chess. There are as many ways to light a kindling fire as there are moves to start a chess game, watching the development of the tiny flame slowing passing from twig to twig. It is a challenge to set the evening fire without using paper, just torn bark, dried leaves and twigs. The fire develops like a chess game, each time taking different paths, different strategies, depending on who has set it, who is playing. Every thing has its place, time, feel, smell, thought and reference or recollection. Although I have slowly been seduced by email, I still write important letters with my Lamy fountain pen on beautiful paper. Because I really appreciate it when I get a hand written letter myself, although it is becoming a rare event these days. A hand written letter has the touch of the person about it and like the famous madeleine biscuit, it takes me there in my mind to that person and place. Something that email has yet to do for me. I know that I am simply showing my age, but I am confident that my son has no such reminiscences. He has very agile thumbs and dreams of electronic text and symbols. The hum of the processor and the whir of the cooling fan are his madeleines. The i-phone touchscreen and i-pod click-wheel have replaced the taste of a licked envelope and stamp for him. So it is with much of what I admire and reflect on with fondness, skills and practices that are slowly fading, materials that are no longer considered, touched or worked. I still collect my own clay and stones to make my pots and glazes. Of course it isn’t economic to do so but neither is writing with nib and ink. It is simply rewarding to do it and therefore time has to be found for it, and so it is with a good pot. Beautiful things just have to be made, no matter how long it takes, someone has to do it, there is far too much ugliness, violence, greed and stupidity thrust into our faces each day on the nightly horror (hour) that masquerades as TV (news). I love beautiful things, simple things, but not too many of them, I can only take in so much at any one time, but clay is wonderful. I find the stuff of which pots are made is just so interesting, discovering a new stone or gravel and playing with it until it reveals itself and its possibilities has been a continual fascination. I have not been able to find a suitable plastic clay body that can be thrown freely and vigorously. I have however come across a lot of stones, shales and gravels, perhaps because that is what there is where I live. Some of these have proved to be extremely fascinating to work with. They are not plastic in any normal sense of the term, but I have found that I can work with them on their own terms. One such material is a brown, weathered basaltic gravel. When kilned this unusual stuff fires to a matt, jet black, dense body, that quite stunned me, because I was not expecting it at all, with a 20% iron content, I was expecting a glaze, and it almost is, just a fraction too much reduction or a little over fired and it pools into a flat puddle on the kiln shelf. However, when it works it is fantastic. Fig. 9. 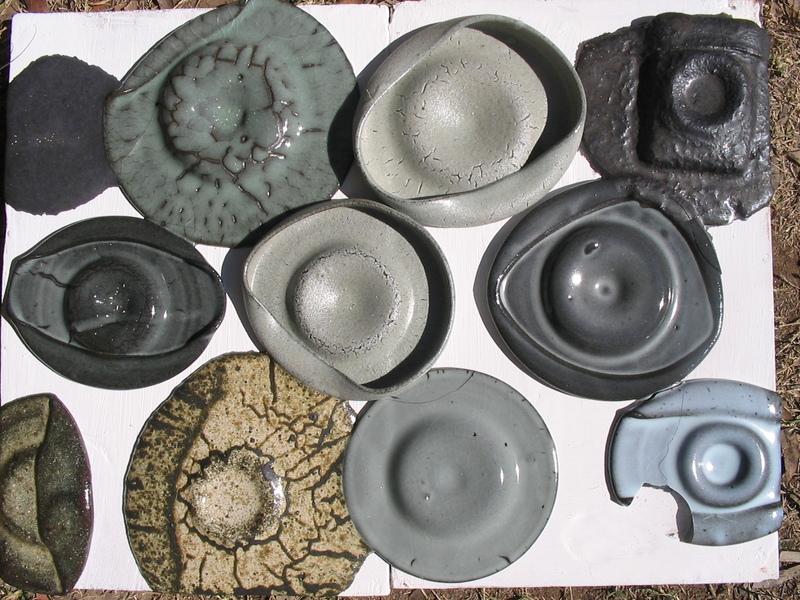 Kiln shelf with slumped blackware bowls, pooled onto the kiln shelf, their foot rings showing prominently up through the flattened disc. 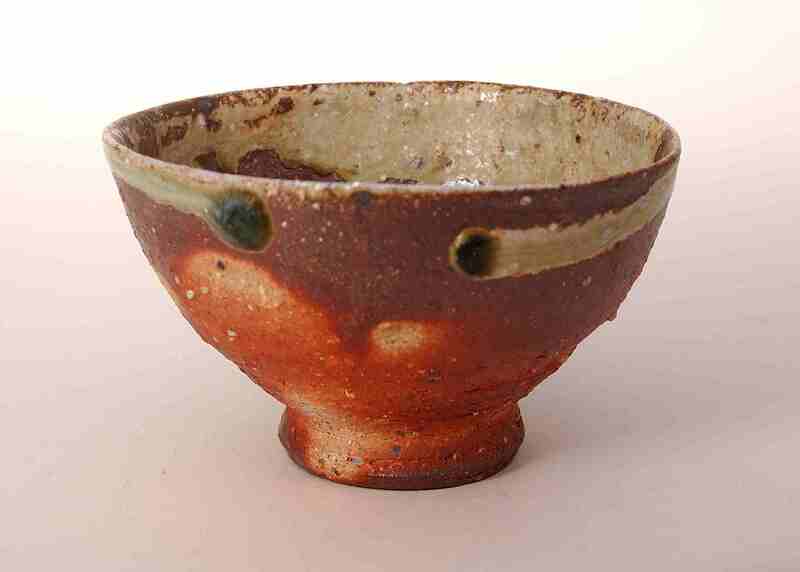 It reminds me a little of ancient Ge ware, and when coupled with an appropriate pale glaze, it has some resemblance to Guan ware. Not that I’m attempting to replicate any ancient tradition, just noting the similarities in the essential beauty in this material, just as I appreciate beauty where ever I find it with all sorts of materials. My favourite ceramic material is a rock, a native bai tunze porcelain stone that I found not too far from here in a deep remote valley where few people go. It is an extremely hard, fine-grained, white aplite stone. It needs to be broken down in a jaw crusher and then ball milled for 12 to 16 hours to become fine enough to work with. It is certainly not plastic, even with the addition of some bentonite. It is difficult in the extreme to throw, but rewards patience, it needs to be slowly coaxed into shape and then still requires a lot of turning to complete the form. An upside of this patient technique is that I have discovered a love of turning. I have also discovered that 7 years of ageing improves the plasticity of this material enormously. The finished product is a wonder to me, 99% ground-up hard rock paste miraculously becomes a beautiful translucent porcelain which responds to the wood firing by blushing to a pink/orange/red. My favourite glaze is in fact my porcelain stone body with lime added. It makes for some lovely subtle results. I have discovered that when it is mixed with 15% of lime, it becomes a beautiful glaze for itself and for other bodies, the combination of bai tunze body and glaze especially when wood fired, rewards the effort with a beautiful translucency, pink/red flash and pale bluish glaze. Fig. 12. 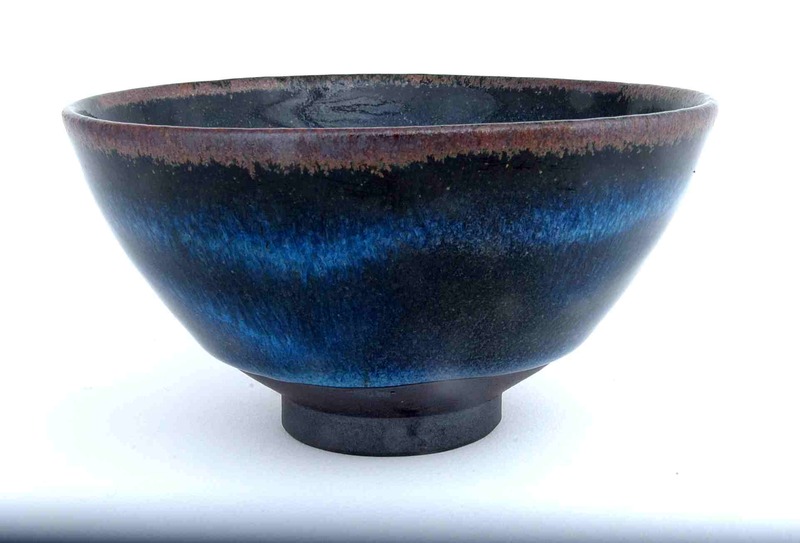 Blackware bowl with porcelain glaze flushed to opalescence by natural ash impingement. When this porcelain stone glaze is applied over pots made from my washed gravel blackware body it becomes a soft greyish satin matt. 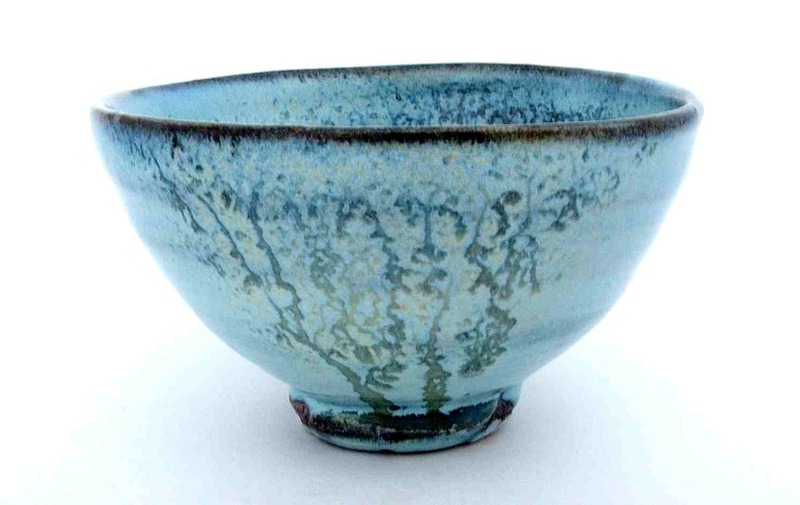 However, when the wood ash hits it during the fire and starts to build up on the surface, it transforms it into a remarkable localised jün glaze effect that is quite lovely and serendipitous. I have taken to mixing my bai tunze with lime and fruit tree pruning ash to create a siliceous opalescent bluish glaze to take advantage of this effect. One of the pleasures (and pains) of wood firing is collecting, cutting and splitting the wood that is so essential to the process. In my case it is central. I am very particular about my wood. 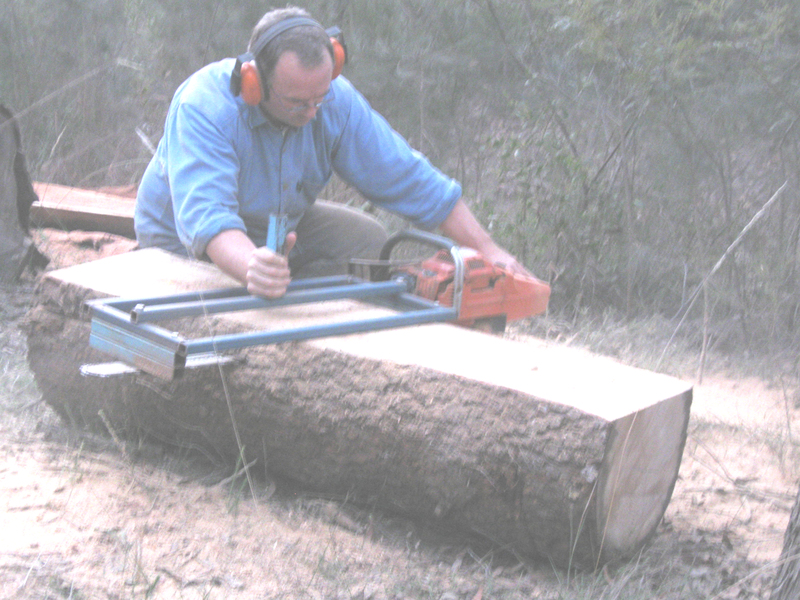 In my earlier career I took off-cuts from the local sawmill. But in my latter career I have become more inquisitive about the subtleties of the entire process and everything turns out to be equally so important. I haven’t decided what I like best and then stuck with that, nor decided to use whatever was there because it was easily accessible. I try and fire each firing with a different type of timber, just to see what there is for me to learn from the process, to encourage whatever there is install for me to just happen. I never know what to expect other than not to expect anything, but it is almost impossible to resist that most human of failings – expectation. 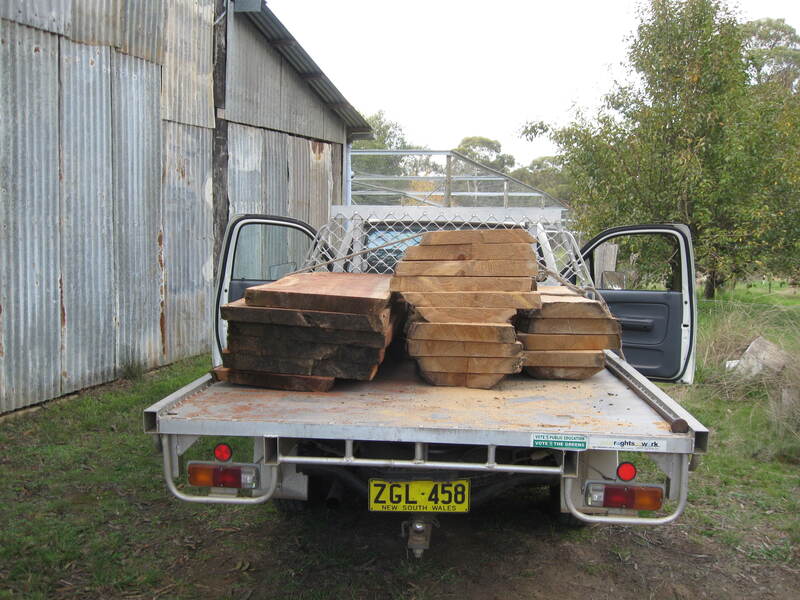 Because I select and collect timber from any number of unlikely local places, I come across all sorts of wood, mostly from gardens; loppings, fallen trees, fruit tree prunings, all different and each has proven to be an experience in itself. Not all wood is good for firing, and this makes some firings a little bit difficult, but I always keep a little stock of something that I know is reliable in reserve, just in case, but I rarely use it, I prefer to persevere, to experience the unadulterated result. Some times I come across a tree that is far too good to be burnt as kiln fuel, it deserves better. Some logs are straight grained, free of branches and call out to be made into furniture. It would be a shame to burn them. I am not much of a wood worker, but I don’t like waste and as I need something to sit on and a house to sit in, I’ve made chairs, tables, doors, windows and roof trusses for my house, slowly over the years, as the necessity and/or opportunity arose. Fig. 14. 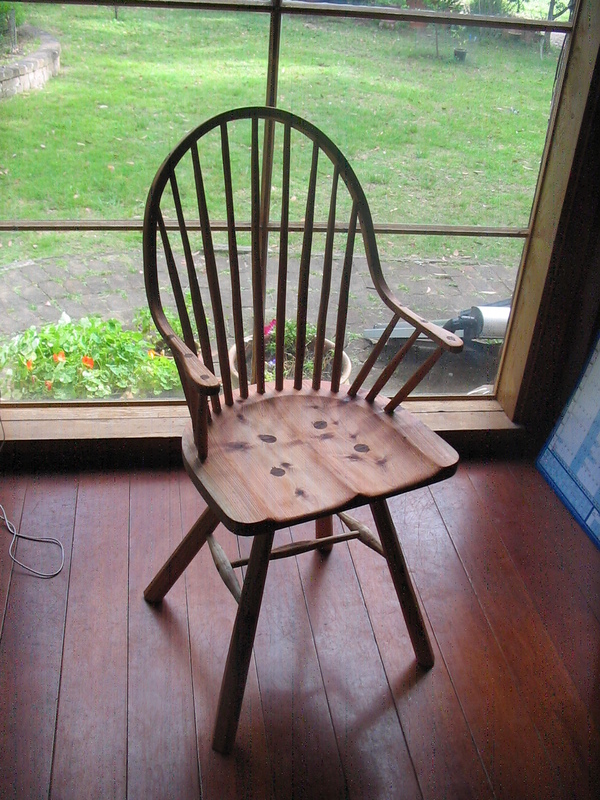 Homemade Windsor style chair with double bent steamed arms from home grown timber. In keeping with my philosophy of self-reliance I built my own chainsaw mill to do the job. Perhaps it’s not as good as the commercial equivalent, but it does the job adequately, if somewhat slow, but I’ve got time. Working with a chainsaw is tiring, dirty, noisy and the exhaust is bitterly caustic when inhaled. Although the work is hard and not very pleasant, the results of the effort are quite productive, as a chain saw is very effective tool. I suspect that there is something about the feeling of being tired, covered in saw dust and smelling of two stroke oil that somehow magnifies and justifies the few planks that are the result of the days work. However, it is waste forestalled that spurs me on. The fact that it is done with home made tools is a bonus. When I first thought about milling my own lumber, I enquired at the local chainsaw dealership and was told that I would need a two thousand dollar chain saw and a three thousand dollar attachment to mill timber. I decided that I would just try buying a long bar and rip chain, for $100 and weld something together myself. My experiment has been working fine ever since. Fig. 16. Milled logs on home built truck body. Fig.17. The Old classroom 1975. 33 years ago, my partner Janine King and I bought an old abandoned and derelict single room school classroom built in 1893. When we decided to extend it into a house, one of the things that I had to confront was the fact that the old building had sandstone window sills. I decided to have a go at cutting my own. It became obvious that I needed to build a forge to make the stone-working tools that I realised I needed to cut and shape the stone for the sills; bolster, pitching tool, point and broad chisel. Steel and stone are not as tactile to work with as clay and wood, because most of the work requires gloves, goggles and a respirator, although distanced by the safety apparel, the experience of forging steel, then splitting and facing stone with it is unique and just as enriching in it’s own way as it is necessary. I certainly couldn’t afford to pay a real tradesman to do all this skilled work. So it becomes a matter of learn the skills and do it myself or change aspirations. I decided that I would give myself the challenge and although I don’t make tools, sills, chairs, windows or just about anything as well as a fully qualified tradesman might. These objects are mine, not just made onsite, but often grown onsite too. Assembled with all their faults and character, they are my faults and my character. These are all real materials, grown, forged, carved, and thrown here, they couldn’t be more local and I engage with these various materials, clay, stone, gravel, wood and steel to create real authentic objects from them. Objects that sustain my life in everyday use, just as the working of these materials has enriched me during their creation, occasionally they make there way into other peoples lives and I hope that they are able to enrich their lives as well. Fig. 20. 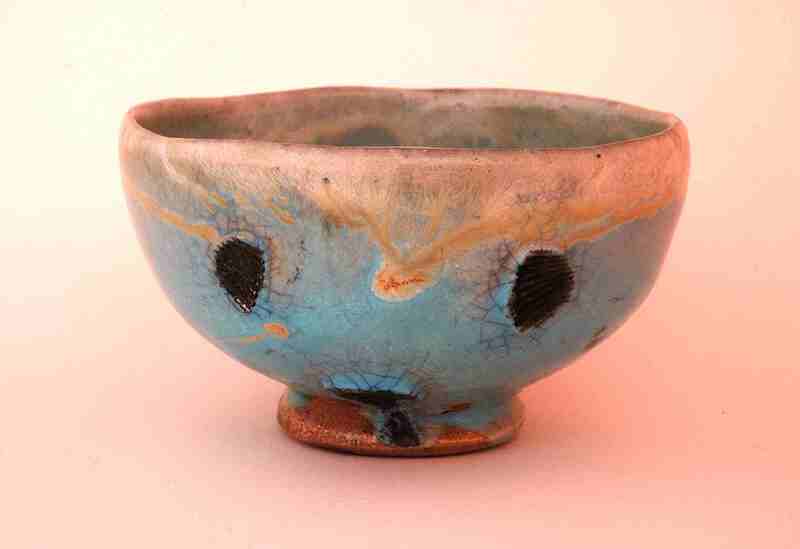 Wood fired pink flashed Porcelain bowl with white flame bleaching and golden lustre with blue celadon style glaze. Thrown from my milled and aged local native bai tunze porcelain stone. I am aware that I have been very privileged to have the peace and security provided within a stable affluent society to be able to lead a creative life on the fringe of society. Perhaps I would have made better pots if I had been able to work exclusively at that aspect of my creativity. As it’s turned out, because I could not, I’ve been very lucky to be able to work in a full range of creative areas with lots of different materials, while still being self directed and self employed which has resulted a much richer amalgam of a creative life. This strange busy life, with so much content, sometimes makes a holiday seem dull. 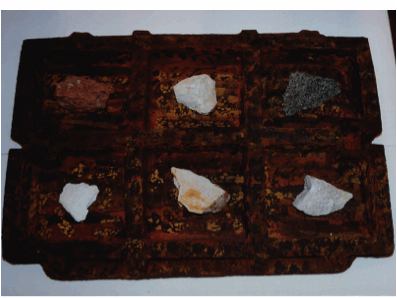 Ceramics Technical, No 24, 2007, P.46a. I chose to title this piece ‘Life as amalgam’ for the obvious reason that there are many competing elements juxtaposed to make a whole, and also because amalgam, has a specific metallic reference. Metal has been a link that has joined the various stages of my ceramics together over the period. The cleverness of some individuals never ceases to amaze me. I have studied ceramics in Japan a few times and always find something new to surprise and amaze me. There have been a few individuals that I have learnt about. Sadly all past now, so no face to face contact is now possible, but their work and achievements survive through their students, their apprentices and the legacy of their work. People like me have been inspired by them, taken their ideas and built upon them to create pots that have regional character in other places. Toyozo Arakawa worked in the Mino area near Seto. 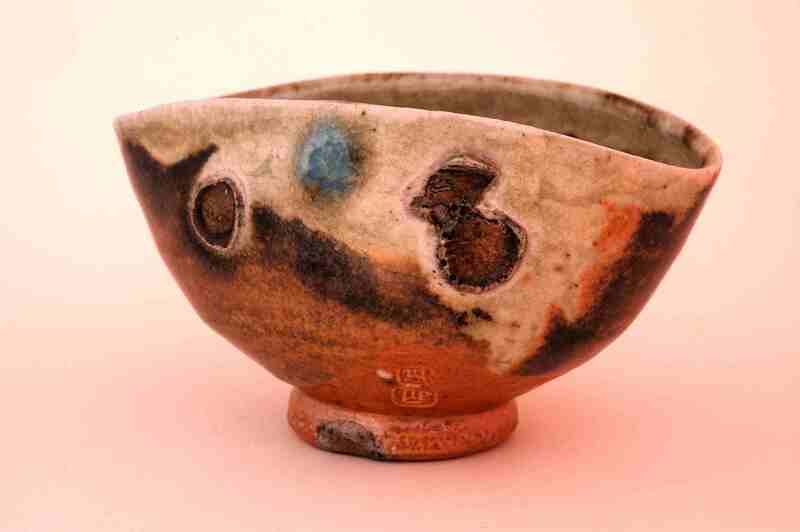 He got the clever idea to re-create the old shino ware, that was only known at that time from a few shards in museums. 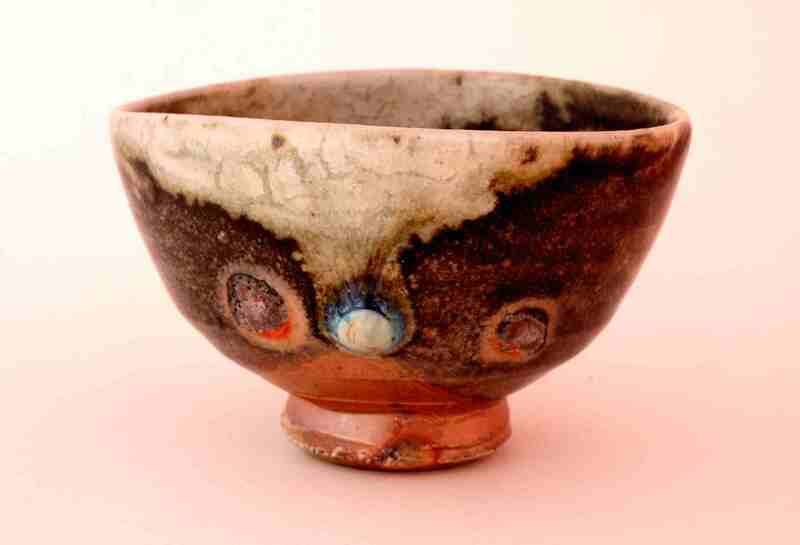 His research and determination culminated in his re-invention of the ancient style in a new form and in a new way, using a very small anagama kiln and firing the pieces in saggars. 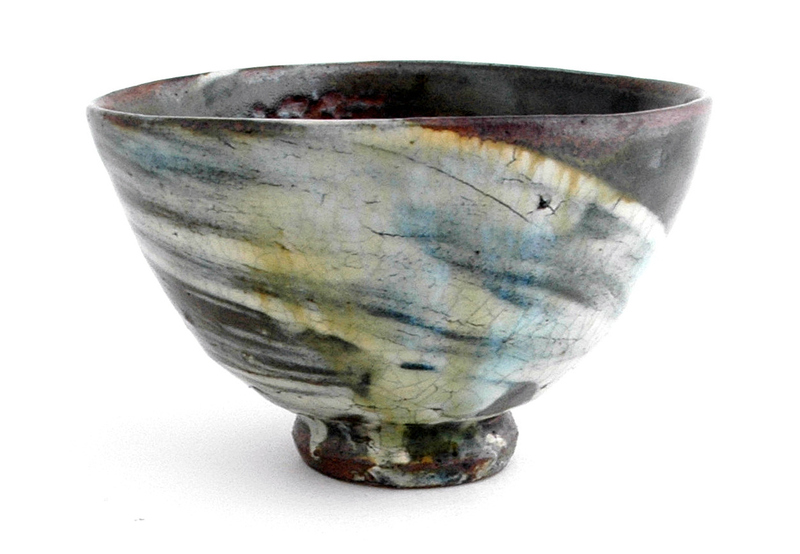 Through extensive testing and research he evolved a contemporary way of making new pots that had all the best qualities of the old shards concentrated through the osmotic filter of his intellect, such that every pot of his that we were allowed to see was the essence of the best of the past. The actual pieces however, bore no real resemblance of the ancient shards. 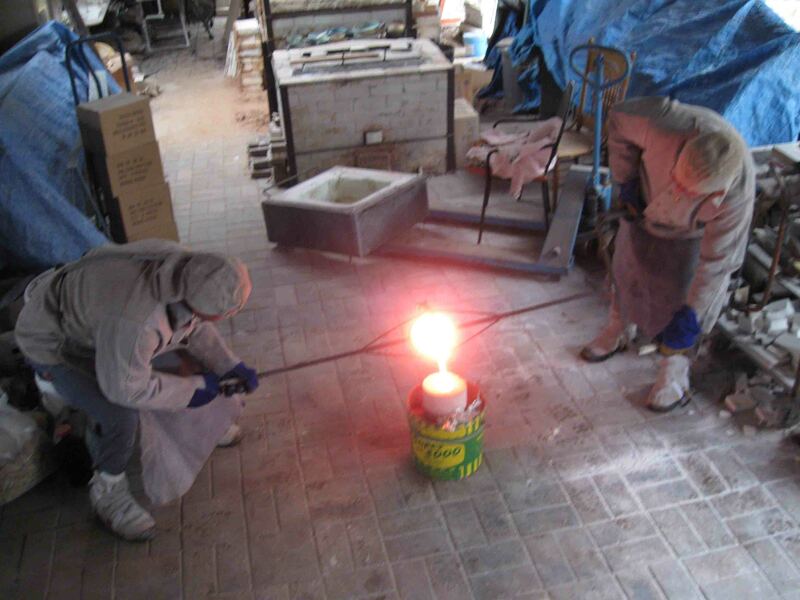 Toyo Kanashige completely re-invented Bizen from the ashes. He saw a little something in some of the old pots, something fragmentary and fleeting. He realised that some of the surface qualities he recognised, could be reproduced in contemporary kilns even though this ephemeral event was very limited in the old huge climbing kilns. He realised that It could be lensed into something special, if a new kind of kiln was made. He single-handedly reinvented Bizen in just the same way that Arakawa did for shino and as Furutani did in Shigaraki. Kanashige made a small kiln that was all ‘sweet spot’. All the best pots came form the firebox, where the ember contact occurs and the greatest temperatures are and where all the ash is concentrated. So he packed his pots in the places where nothing much usually happened as well as in the fire box, and then blew in the ‘natural’ ash from previous firings into the kiln using an agricultural fertilizer/fumigator blower, and bought in charcoal which he shoveled into the chamber and onto all of the pots in the usually ‘dull’ spots, through special holes in the wall of the kiln, onto all of the shelves, into all of the places that were usually without special qualities or spectacular results. He made them all ‘sweet spots’. No-one had thought of this before him. Now everyone in Imbe uses his technique. And it is so obvious and yet so simple, so clever! Mitchio Furatani single handedly changed the course of Shigaraki and Iga traditional ceramics, by quite simply reinventing it in a new form that paid homage to the old aesthetics but was created in a completely new and original way to make the old work appear to live on, but realityy only in reference form. The big old climbing kilns of shigaraki were meant for the production of large format ceramic charcoal fireplaces, hibachi. 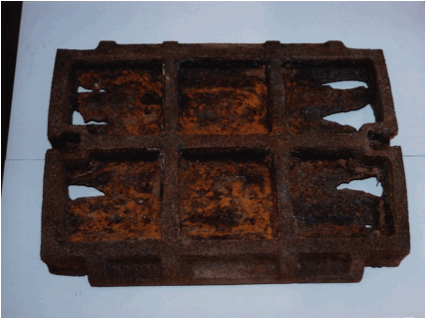 They also produced a very limited number of small objects in the fire mouth and side stoke grates of the kiln. These objects could be startlingly beautiful, but only in a very limited number, as the area of the kiln available to produce the right conditions for such effects are extremely limited. He looked at the problem of up-scaling this limited effect and came to the conclusion that a completely new kind of kiln and firing technique were required. He took the universal idea of the anagama, or single chambered kiln (ana = one, gama = kiln) and reworked it as a two chamber anagama. The two-chambered, single chamber kiln? Good one! He extended the firebox so much that it became larger than the kiln itself, instead of an addendum to it. He fired all the work in the ‘chamber’ of the new kiln, which really became the 2nd chamber of the single chambered kiln, for a first firing and then painted on the “natural” ash glaze, collected from the firebox ashes from previous firings and then re-fired the work in the grossly enlarged fire box which he had made into a first chamber of his two-chambered-single chambered kiln. (Don’t ask! It really doesn’t make sense to me either). Sometimes he would re-fire twice or three times. He did this in such a way that all the pieces were always in the ‘sweet’ spot up against the embers. He managed to extend the ‘sweet’ spot everywhere. He created the right conditions for the happy accident all of the time. He made the extraordinary into the norm. Now every potter in Shigaraki and Iga uses this technique to some extent or another. I’ve learnt from these people tangentially. I worked in Imbe with the Isazaki brothers studying the techniques of Bizen and later in Shigaraki with a student of Mitchio Furatani. Janine and I were lucky enough to be able to visit his son Kazuya to witness the unpacking of his latest kiln before his big show in Tokyo. We visited Mino, the ‘shino’ region and we also spent time with Tomio Suzuki in his pottery workshop and trawled through his ‘Kura’, fireproof pottery storehouse examining many of his pots and have collected some of his shino wares. The one thing that all these learning experiences have in common, is that all these potters created the right conditions for their own particular work to flourish and change, incorporating the old, while being brand new. I realised that there is nothing that should stop me making every place in the kiln the ‘sweet spot’ too, if I think carefully enough about what I do and how I do it. Every technique is valid and should be considered the ‘killer app’. Every piece should be given the chance to be a jewel. Nothing is off-limits as long as it makes the work better. It’s a matter of creating the right conditions. All these experiences and thoughts have been percolating through me for a while and a mixture of the techniques that I witnessed and learnt are peeking through my own natural style. There is nothing quite like getting out of your comfort zone, learning to cope with the unexpected. Engaging with life’s experiences and internalising them and then folding them back into the creative work. All these things have had an effect on my work. Even if I’m not aware of it at the time, and sometimes perhaps, even when I don’t want it too. But it is all still in there, patiently waiting to express itself through work. The last two visits to Japan have reinforced and magnified those particularly Japanese influences in my work. This work in not exactly like any Japanese work that I have seen, but I can see the influences. After my last show here at Watters, I pulled down my old small kiln. I rebuilt it in a different way, similar in general, but quite different in particulars. I stayed with the concept of the flame lens design, but went about it in a different way. I have spent the last two years learning what we can do together, and I think that I am starting to get some nice results. I’d like to think that in my own small way, I’ve done something a bit like what the Japanese masters did, only in microcosm. I have reinvented myself and my own self-reliant, locally sourced ‘terroir’ based aesthetic style, but added to it in the best way possible to get the best result at the time. What has come from this period of work is loosely based on a Shigaraki/Iga/bizen/Mino foundation, but with my own twist. The flame lens design of my kiln, focusses the fire on to the work and when it does, it deposits wood ash onto the pots, the wood ash melts onto the surface of the pots and where it is thick enough, it starts to run, or make my bai tunze and ash glazes run, and this then forms a decorative droplet. For this show, I have focussed on this particular effect and tried to give the pots a slightly more dramatic quality. I am pleased with them, because they have both darkness and some light. They have the right feeling for me at this time. I’m a tradesman. It’s a complex trade of multiple skill combinations. I work with my local materials, the rocks and stones, the ashes and gravels of my home here in the Southern Highlands. I collect ashes from the firebox of my kiln and from our woodfired kitchen stove. I stitch together all the variables; the person, the place, the climate, the soil, the kiln and firing techniques and manipulations. The results are these few pots. I celebrate my craft. I work with my assets. My hands and my mind. I create these wonderful, rich and engaging pots. This is my years work. These few pieces are the best of the hundreds of bowls that I have created over the past 2 years since my last show here. Not very much it seems, for so much time and effort. I create these things with passion and attention to detail. Every one has the chance to be ‘Sweet’, but I fail. So very few make the grade. This only goes to make the few survivors all that more precious and ‘Sweeter’ to me. Dirt on our hands: Is there life after mining? Mining is a long and ancient tradition that goes back for millennia. But controversy is all that we hear about on the news these days: the vast amounts of money being made, the scandals, the personalities, the notoriety, the politics and the corruption. Well it hasn’t always been like that. Yes, there was mining, but no, the miners weren’t always so well paid. I’m a potter, and I choose to work with the local geological resources that I find around me. It grounds me in this locality. My Yorkshire grandfather was a miner, as was his father. His first job was down the pits. He picked out a living down there at the face to help support his parents and would have died young down there in those damp dark galleries along with so many others, if it hadn’t been for the First World War, that miraculously saved his life. There is such irony there. He survived the Great War, but it ruined him; apparently he was never the same again. It also politicised him. He returned to the pits after the war and led a strike that eventually won a ha’pen’th a week for the men, but got him the sack. Black-balled by the owners as a trouble-maker and communist, he was forced to move his young family and get work as a quarry man elsewhere using the few skills he had. He eventually laboured on the roads spreading the gravel from the quarry that he used to mine and ended his days as an itinerant gardener. He always had his hands in the dirt. A life alternately spent between frugal comfort and poverty. Those were his times and that was his life. My grandfather told me his stories of his life as a miner when I was a minor. I loved his descriptions of the land, the soil, the rocks, the techniques of mining and the descriptions of minerals. I started a rock collection while still at primary school and when I found myself in Art School at East Sydney Tech, it wasn’t a great leap to find myself in the pottery class encouraged by Peter Rushforth and Col Levy into incorporating rock dust, clays, shales, wood ashes and all sorts of other minerals into my practice to make my glazes – something that drives and inspires my work to this day. Although mining has gained a bad name for its desecration of the landscape over the years, because of the get-rich-quick mentality of some of its proponents and poor to non-existent remediation in the past, there is also another side to the story. 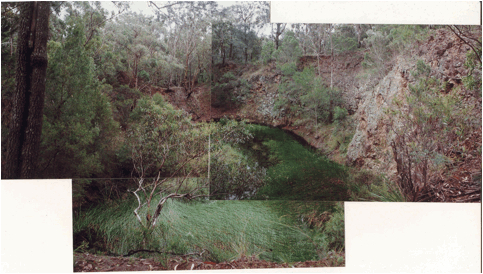 I have worked with the landscape of the Southern Highlands for the past 36 years, fossicking around in all sorts of remote and off-the-beaten-track places. I’m not a miner, I’m an artist, but I have found myself in a symbiotic relationship with some of the local miners. I can use what the miners discard. In the case of a working mine site, there is often dust that falls from the crushers and builds up around the machinery. This is ideal for making glazes, as it is already finely powdered and almost ready to use. This dust needs to be cleared away periodically, and in the sixties and seventies, when health and safety had not yet been invented, it was OK to wander into the mine site, find the works manager and ask to be able to collect the fine dust from under the crushers and conveyors. He would say something like “mind your head”, and that was it! A year’s supply of local glaze material, that fixed my work directly into this environment, was there for the taking. Times have changed. Urbanisation has sterilised all the old mines and quarries here now. There isn’t any more crusher dust to be got so easily now and where there are still working mines or quarries. It now takes letters to the management seeking approval to be ‘signed-in’ and do site inductions and then to be escorted by the WH&S officer around the site, where a safe, but distant view can be gained from the window of the back seat of the dual cab. While later, a pre-packed sample bag of finished mineral fines will be presented as a souvenir of the visit. Compliments of the company. Unlike my grandfather, I don’t get to get the dirt on my hands any more at these new quarry sites. However, there are other opportunities to collect suitable minerals for the creation of site specific, locally produced ceramic artworks. There are a surprisingly large number of old quarry workings, long since abandoned, that are now overgrown and slowly returning to a natural balance with the forces of nature and they are quite simply stunning places of peace and quiet and surprisingly, great beauty. Just a few kilometres from my house, there is an old abandoned mine site that dates back over a hundred years. I have been told that the site was so remote back then that a small village was built on-site for the workers, as it was too far to travel to get to the workings each day. After the site was worked out, it seems to have been completely abandoned, with anything of value transported to new workings or souvenired by the locals over the years. Virtually everything else has been eaten by white ants or burnt out by bush fires during that time. The forest has returned and the site is hard to identify until you are right on it. I love to walk into this site and wander around. It is so very quiet, way out in the bush, surrounded by forest. Deep in the pit there is only the blue sky to be seen above and the broken and shattered rock walls all around in this man-made caldera, this stone bowl. There is virtually no sound at all that can penetrate these walls, deep inside the earth. It is only once you get accustomed to the lack of ‘ordinary’ everyday modern industrial noise of distant vehicles, trucks changing gear, trail bikes and chain saws or even gunshots, that you start to realise that there is other life here. There is a rich stream of biodiversity, of small birds and lizards, of beetles and suddenly frogs, hundreds of frogs that have colonised the pool of water that occupies the centre of the bowl. Clear rain water held in the hard rock cistern and supporting a multitude of creatures, an entire ecosystem is thriving here. This has become a really beautiful place now, if you take the time to sit and listen, almost a magic place it seems to me, green and lush at its centre. Like delicately frothed green matcha in the centre of a Japanese tea bowl. There are reeds and sedges colonising the water, moss and lichen embracinging the stones and wattles and shrubs clinging tenaciously into the bare rock crevices. 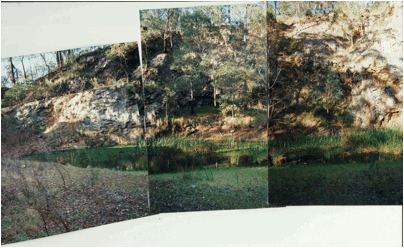 I patch together these David Hockney-like photo montages. It’s almost like trying to reassemble the broken environment back together, into a semblance of completeness, but they utterly fail to convey the feelings that I carry for the place. When I’m there, it’s different, I sit enthralled, in wonder. My! How time heals! This once barren hole, torn apart by machinery and blasting powder, has now become a refuge, an ark, a very special place in my mind and life. I decide to make an art work. During my investigation of the site, I come across what appears to be a half-buried slab of cast iron, but upon excavation, scratching away the sand and gravel from its surface, it turns out to be a worn-out and discarded crusher jaw plate, left over from the crushing machine that was originally breaking the ore down to gravel-sized chunks. It is quite massive, very heavy and worn through in a couple of places. On the reverse side it has an interesting grid of reinforcing struts that make it an intriguing and charming object in its own right. Rusted and weathered into a state of great beauty. I am quite struck by its presence, by its quality of ‘wabi’ and ‘sabi’. These specific Japanese words, that have no direct translation into English, convey a sense of nostalgia and reverence for old, time-weathered rusty objects. This cast-off mining relic has ‘wabi/sabi’ in spades. I take it back to my workshop and drop it gently into damp sand; when retrieved it leaves a perfect impression of itself in its grid-like precision. I pour in a mixture of white cement from the local cement works and broken windscreen glass, collected from the side of the road near the quarry. When set, I fire the cast in my kiln and it becomes a permanent ceramic, silvery grey/brown, ghost-like doppelganger of the original. I also sculpt a life-size model in soft plastic local terracotta clay. I paint this with a series of mixtures of granular rust flakes from the ground around the crusher jaw and other mixtures of iron oxides and ochres collected locally. After firing, it makes a convincing representation of the original. I decide to show these homages in a group show of ceramics, at the Manly Art Gallery and Museum. I decide to invert the objects and show them upside down, grid face up, and use them as larger than life mineral specimen trays, filled with samples of the minerals that were used in their own creation. I’m happy with the installation, an homage to the beauty that can be found in the abstract side of mining and mineral processing. However, I can’t help but feel that I need to do something more. I need to make my peace with this place, to share something of myself with the site. I feel compelled to make a meaningful gesture. I return to the site and collect a few of the many spalls that comprise the ground here. I take them home, crush and grind them to impalpable fineness, then form this rock paste with great care and attention to detail into a beautiful bowl. I create a Japanese-style tea bowl. That represents a receptacle for thoughts, feelings, ideas, and life itself. This is a symbol of the pit as vessel for new life, but also mirrors the tea bowl-like state of the inner pit. I fire my totem vessel in my kiln, until it fuses into a perfectly beautiful glossy, stoneware ceramic piece that will last another hundred years at least, if not broken beforehand and even when it is destroyed, like the mineral deposit that it has been made from, its hard-fired ceramic shards will last as long as the remaining stone spalls that litter the floor of the pit. Once cooled, I take my sacred vessel and return it to its birthplace. I position it in a crevice in the rock face. It carries all my good wishes, best intentions and spiritual inclinations, if I have any. I’m not sure that I do. I’m not religious, but I am definitely moved by the transformation of this site over the one hundred forgotten years that it has been left to itself to heal and transform. Left to itself and given time, life will heal itself and come anew. I sense that just a little bit of the world-weary me has been elevated somewhat by this encounter, by this art work, by this installation. I keep my special place to myself. In my mind’s eye it will always remain beautiful. I haven’t been back. My special vessel will always be complete in its womb-like pristine enclosure. Teeming with new life. To me it is akin to Schrodingers Cat. As long as I never look I know that it will be there. It will always be alive, special, perfect in its own way and beautiful. However, I am mindful that nothing lasts, nothing is forever, nothing is ever finished, and nothing is perfect. My grandfather was once shattered and broken, but he was lucky to live long enough to find a new life here in Australia. He ended his days in retirement, slowly breaking up the stone slabs on my parents’ Sydney sandstone block, using his skills, his picks and hammers, utilizing his shims and gads, his mysterious wedges and feathers, his pitching-tool and bolster. He reduced the biggest tors to neat small blocks. From these labours he built dry stone walls in the Yorkshire style, to create gardens and he grew marvelous vegetables. Life springing anew yet again. Always dirt on his hands. It’s been just over eight years since I discovered the Joadja bai tunze native porcelain stone deposit near Mittagong and started making my special bai tunze and washed gravel bowls. I work alone, I tend to work directly from my emotions and intuitions, so if I have any objective, it is this; that I work independently using only what I can fashion myself from my own local resources. My work always addresses beauty and the contemplation of beauty and my interaction with the natural word. My failure to adequately achieve this is what drives my search. My main concern at the current time is to envisage some sort of relationship or engagement between intellect and passion, thought and action, trying to bring some harmony into my own troubled existence through the creation of beautiful objects while dealing with the tensions and anxieties of a modern life. A life that I am attempting to live ethically and responsibly. It is easy and glib to rattle off such statements, but very difficult to walk the walk, to actually live it. My hundred moons of solitude have allowed me to indulge my introspection and I have come to realise that Garcia-Marquez was talking to me when he discovered that place, the gap between reality and fantasy, the realm where inspiration lies. Reality is all tough, hard work, fantasy is much more plastic and malleable, like clay. I feel that I ought to write something profound about this, but fail to. I would have liked to have written something meaningful perhaps about Henryk Gorecki and Arvo Part’s spiritual minimalism and radical simplification and how it’s influenced my radical localism and minimal spirituality, but apparently not. I wish that I could have written about my desire for beauty and simplicity, my trips to Japan, where I failed to find my muse and how simplicity is so complex that it is indescribable and how trying to make something elegant, simple and uncomplicated, simply isn’t simple or uncomplicated. I’d like to have said that the many long hours spent doing mindless manual work like the sorting of little white granules of quartz from the dross of dark rubble found on an ants nest, so as to get just the ‘right’ textured grit to add to my clay body, is actually exhilarating in the achievement of it, and that the most boring job of grinding stones down to dust so as to make a glaze can be very rewarding. I wanted to express something of the beauty and the rewards in the many little steps in the creative process, no-matter what they are and that I’m actually starting to realize that I’m often happiest labouring at this tedious nonsense, not just because it is leading to something bigger, (which it is) but because each step, each event, is complete in itself, as an act of beauty. They coalesce to create the beautiful, elegant whole that are these works. But I didn’t. Probably all the better. I failed to find my muse, I continue to fail to create it, I fail to write about it meaningfully and I fail to adequately describe my failure. Isn’t life a beautiful and complex thing! I don’t intentionally make ‘Tea’ bowls. 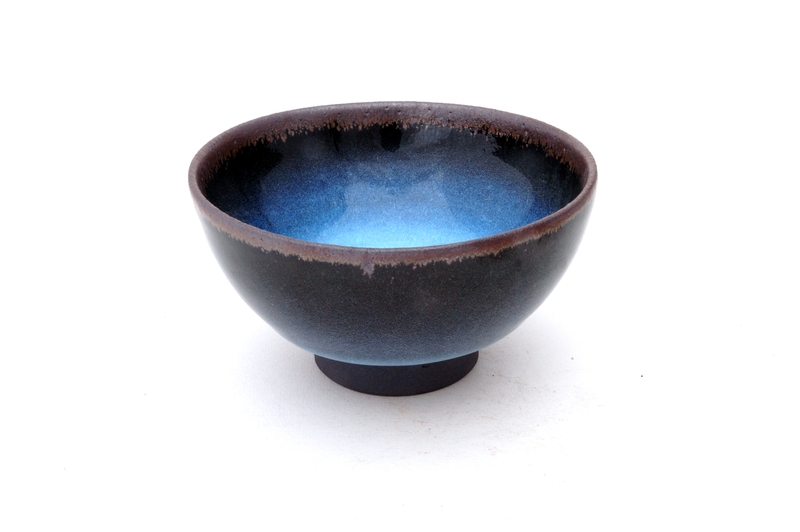 I have collectors who have bought my bowls and told me that they are going to use them for ‘Tea’ ceremony and that pleases me. I don’t know a great deal about the ‘Tea’ ceremony, I haven’t studied it, so I don’t feel qualified to call my bowls ‘Tea ceremony bowls’. 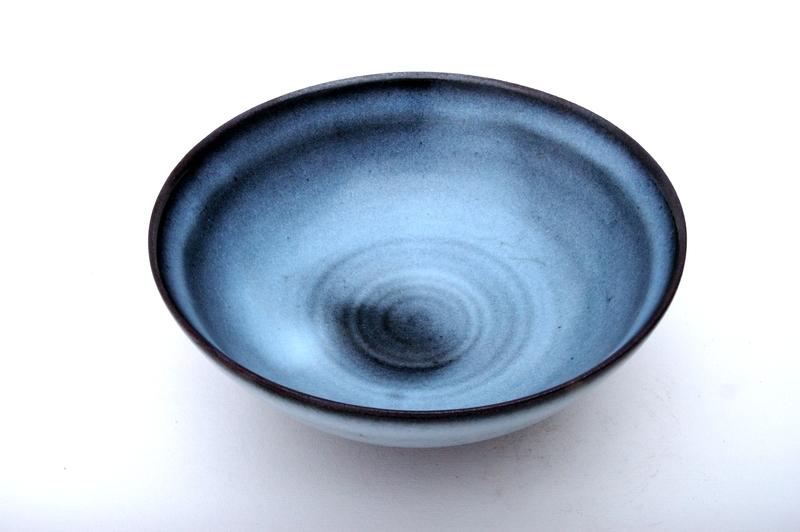 However, I do love some of the bowls that others have made for ‘Tea’, or have selected for ‘Tea’. 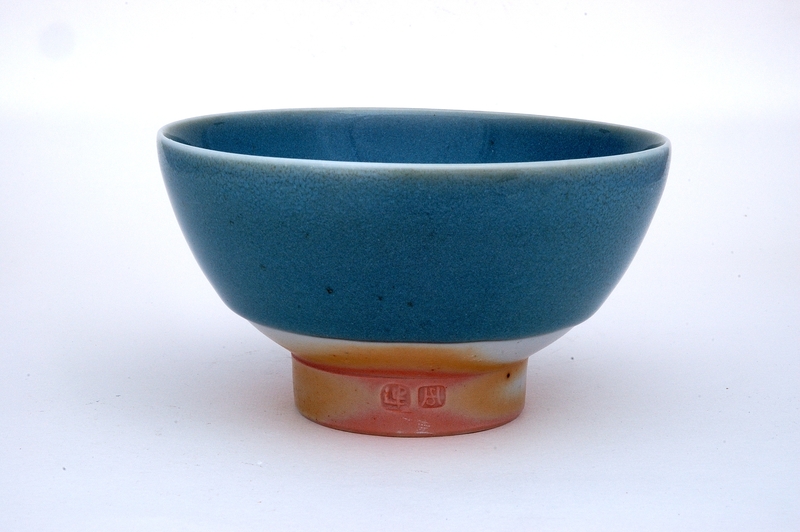 By using the term ‘selected’, I am referring to many of the earliest tea bowls that were used in Japan for the ‘Tea’ Ceremony, some of which were simple Korean peasant rice bowls, some were classic Song Dynasty celadons and others were Chinese ‘tenmoku’ bowls brought back from China by monks who returned to Japan with the Buddist sutras, the habit of tea drinking and the iconic tenmoku bowls from which to drink it. I don’t make ‘tenmoku’ bowl forms, but I do love them. I even own one exquisite Song Dynasty original, complete with silver rim. This bowl was left to me by an avid collector who knew that I would honor it. I also have a few ancient shards of tenmoku bowls, mostly foot rings with fragments of wall. They have proved to be a great resource to study, and have given me a great deal of pleasure. 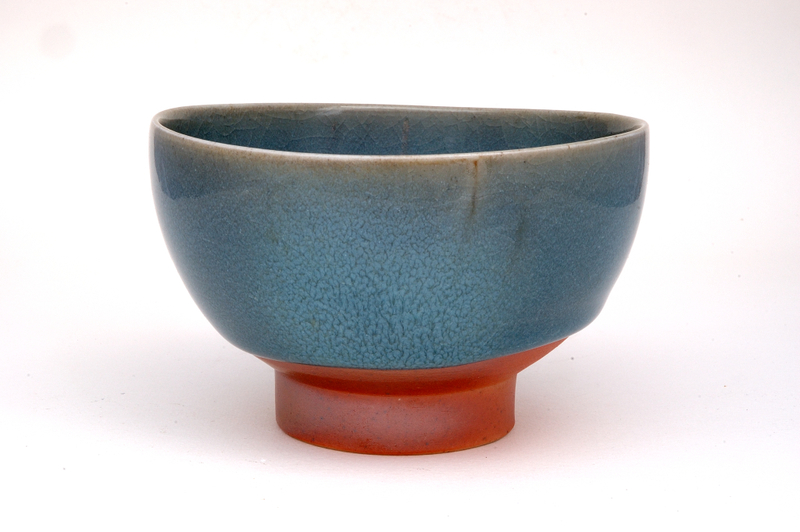 I make some bowls that are inspired by that classic tenmoku form, but not coupled with the classic tenmoku glaze, that would be too close for comfort. I have interpreted the form and coupled it with what I feel is an entirely appropriate dark opal ash glaze, which I find enchanting. Not traditional tea ware, but a modern Australian interpreted functional bowl of a multiple of uses, quite suited for ‘Tea’ ceremony, just tea drinking, or even for eating rice. I don’t make Chinese celadon bowls either. The Chinese do that for themselves perfectly well and always have done. I love those rich, soft celadon qualities from the Song a lot, so much so, that it has soaked into me and precipitated back out again in my native bai tunze porcelain stone bowls glazed using the same local rock as the body, but fluxed with local limestone to create a subtle glaze surface that is inspired and informed by those lovely old Chinese wares. These bowls function well too. I can drink tea from them as well as others might take ‘Tea’ from them. They are capable of fulfilling both functions perfectly well. I even eat steamed rice and miso soup from them, all perfectly compatible as far as I can see. Fig 3. Translucent bai tunze native porcelain stone body with yellow ash buildup and black carbon sequestration on the foot. Grey/green celadon inspired bai tunze glaze. I don’t make Guan ware, but it is impossible not to be impressed by what must be, in my opinion, the greatest high temperature ceramics ever made. It would be an insult to try and copy them, but they can’t be ignored. I discovered a local basaltic gravel that when washed in water releases a very small quantity of clay-like slurry which I have found has very lovely qualities that in certain instances can remind me of the Chinese Ge or Guan ware, especially when glazed using my pale bai tunze stone glaze mixed with a little fireplace ash and lime. This mat, jet-black clay coupled with the thick milky opalescence of my stone and ash glaze is wonderfully romantic and nostalgic. Fig 4. 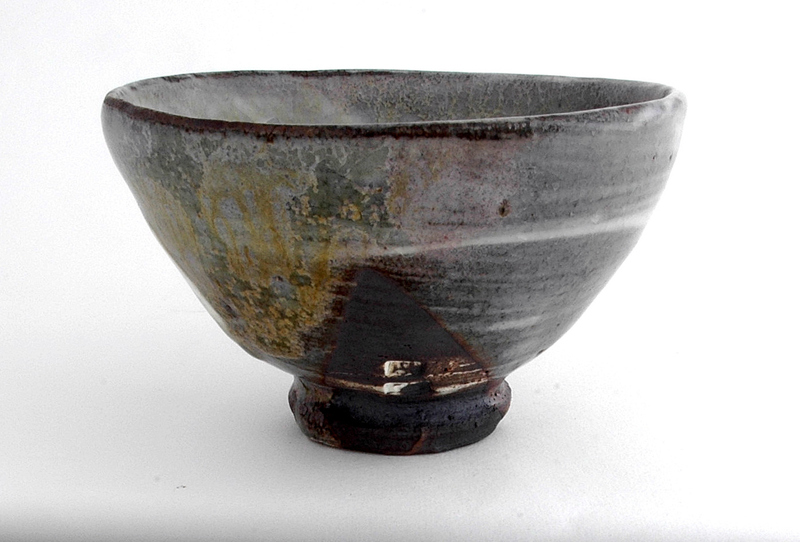 Pale bai tunze, lime and ash glaze over blackware body showing a dark iron rim. 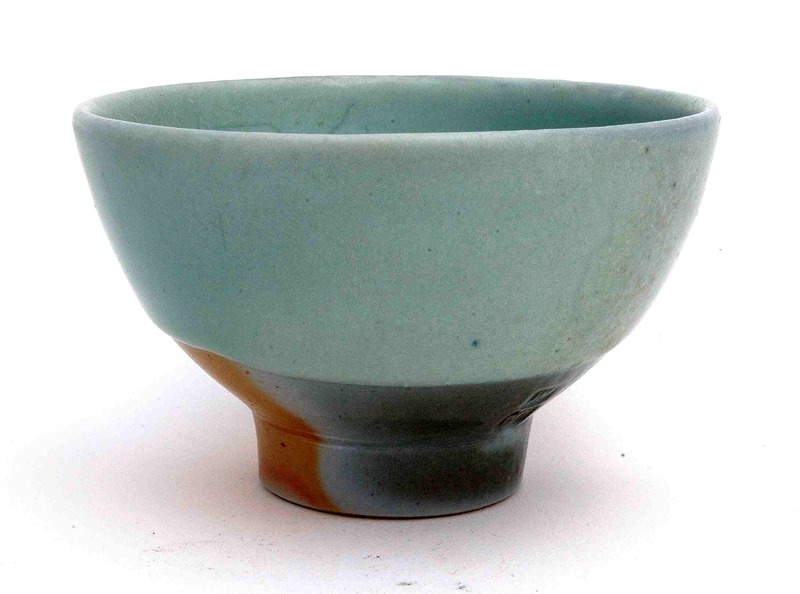 I believe that I am able to make eminently functional small bowls, suitable for ‘Tea’, or tea, even for serving green tea flavoured ice cream perhaps? It all depends on what you want from life and from a bowl. Can a bowl have two or more functions? I believe that it can. It is entirely dependant upon the mindset of the user. To my mind, the only limitation being the exclusion of some strong flavors that might leave residues which could be incompatible. I once spoke to a classical musician who told me that it was not possible to play classical and popular music on the same guitar, as it world destroy the ‘feeling’ that had been built up in the wood over years of practice. I thought about this and wondered if they have different pianos in the concert hall, one for classical performances, another for jazz, another for popular music and yet another for rock music. I don’t know, but I doubt it. I saw Nigel Kennedy play Vivaldi, Bach, Hendrix and klezmer in the same performance. I wonder if his Guarneri has to go into therapy afterwards? I was also lucky enough to catch the Kronos Quartet play (Stephen Prutsman’s arrangement ) Jimi Hendix’s interpretation of the Star Spangled Banner, with all the discord and bent notes. They didn’t change instruments. Fig 5. Blackware body with brushed white kaolinitic slip with thin bai tunze glaze showing yellow ash deposit with pink ‘fire-change’ opalescence. Australia is emerging as a new, multicultural society that is stumbling into this new decade, century and millennium, ready or not. We are an affluent society and anything seems possible at this time. If the Kronos and Kennedy can play Hendrix. Perhaps my bowls can embrace ‘Tea’ as well as tea and even milky coffee, in the French style, for the first cup of the day? The practice of ‘Tea’, from an ignorant outsiders position, appears to have very many rules, a lot of politics, and some contradictions. It seems almost like a religion with sects and branches each calling the other misguided and believing that theirs is the only right and true path. I wonder what those early buddhist monks would think of Hideyoshi, Sen no Rikyu and the current state of ‘Tea’? Because everything to do with ‘Tea’ is so expensive, in Japan, a breakfast bowl can cost $5, but a ‘Tea’ bowl of the same size can cost $500, $5,000 or even more. Potters can make a good living by making ‘Tea’ bowls, so they put a lot of effort into the making of them. 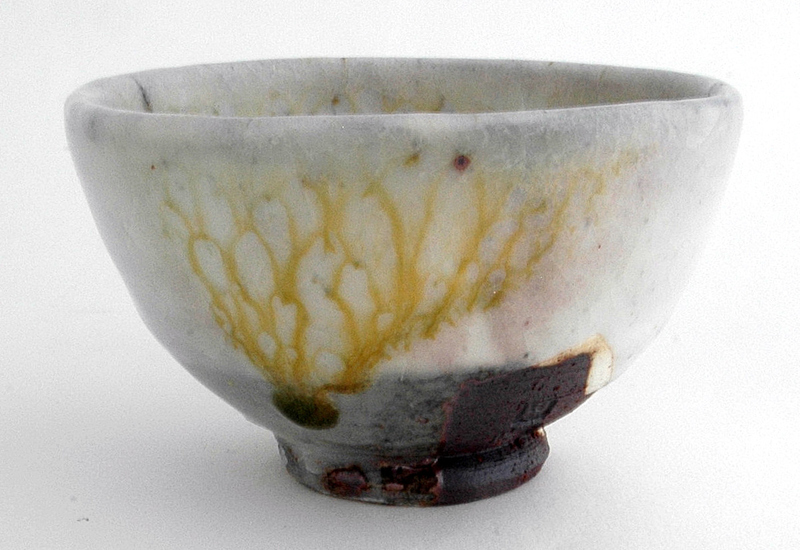 It transpired that the best pots that I saw in Japan were ‘Tea’ wares, mostly bowls. So I’m grateful that the tea ceremony exists, not because I have any urge to practice it, but because I can really appreciate the beauty of the bowls, even as an outsider knowing little of tea. Fig 6. 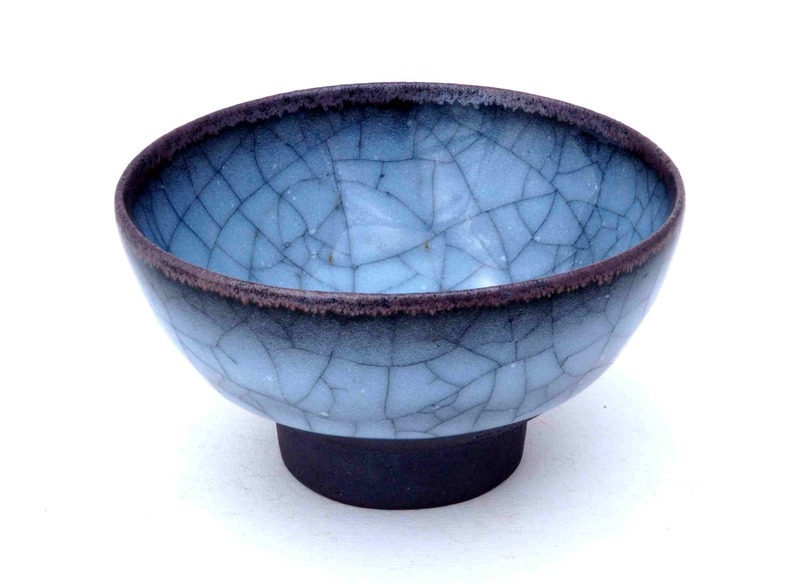 Blackware body with brushed white kaolinitic slip with baitunze and ash glaze showing yellow ash deposit with pale blue opalescence. A lot of clever people have spent an awful lot of time and effort thinking about how to make these (apparently simple) spectacularly elegant pots, pots that I can appreciate for their beauty as objects. Even though I don’t practice ‘Tea’, I own several ‘Tea’ bowls. Once I had picked them up, handled them, examined them closely and experienced them, I couldn’t leave them behind. I had to have them, so that I could learn something from them. Each one found at different times in different places had something to say to me at that time and in that place. I don’t use them for ‘Tea’, but I have used them for tea. The fact is that I just love them. I love the fact that they exist. They weren’t expensive, otherwise I wouldn’t own them. However, I consider myself very lucky to be able to own them, to have stumbled across them. I really appreciate the work that these clever people have put into creating something so beautiful. I aspire to that, to that beauty, to that apparent casual simplicity. Fig 7. Blackware body with brushed white kaolinitic slip with ‘Crystal view’ white pegmatite and ash glaze showing yellow ash deposit with pink opalescence. Sometimes I wish that I were clever too. Sometimes I think that I should learn a bit more. Sometimes, having thought about it a little, I decide that I don’t really want to know any more, because sometimes I prefer the mystery and the romance of my ignorance! Sometimes I make up my own ‘rules’ and stories to explain my decisions about my work, and sometimes my work actually works. Fig 8. Blackware body with brushed slip and opalescent baitunze and ash glaze showing yellow ash deposit. 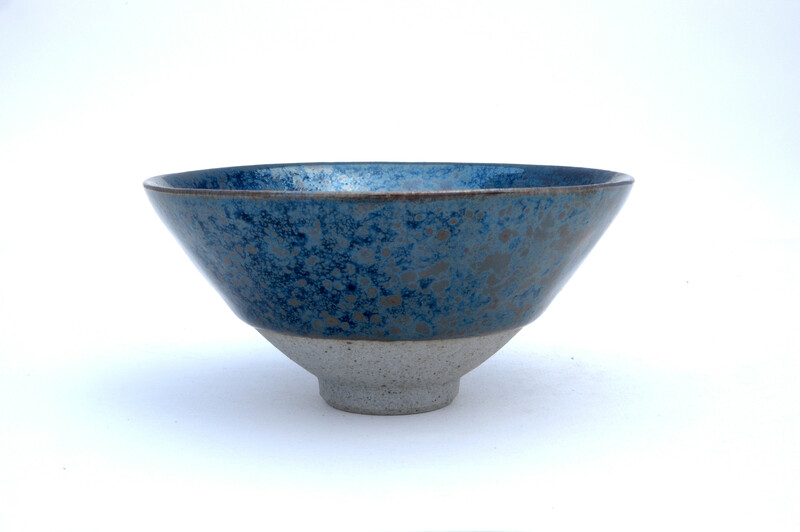 In 2009, I wrote in my diary that I returned to Japan again to find ‘that’ bowl. The bowl that would change my life – I didn’t find it. However, a change had begun to take place in me. I got some sense that this special bowl was there, waiting for me somewhere. I just had to look a lot harder, so I went back again last year. This time I still didn’t find it, because it’s not there, but now I think that I know why and I have an inkling of where it is. It’s in me, it’s waiting to come out some day when the time is right, when I work hard enough and think deeply enough and experiment widely enough, then I might catch a glimpse of it. That bowl that has so much to teach me, that I can reflect on, that I can learn so much from, just for that moment. On thinking this through, I’ve come to realise that these bowls are not just about tea or ‘Tea’, or even really just about my search for beauty. They’re also about me, my striving for the unknowable, the un-achievable. They are about the very difficult quest for a place, a sense of just being. Lance Armstrong famously wrote that “It’s Not About the Bike”. Perhaps in this case, it’s not about the bowl, but about the state of mind of the creative process and perhaps the taking of ‘Tea’ might help take you to a similar place? Now that my sabbatical time of having fun making pots is over. I am back to work in the factory. I have somehow slipped into the habit of calling the pottery the Studio and the kiln building workshop is the factory. This has come about presumably because of my feelings about having creative fun in one place and doing work for money in the other, although I have noticed that I really enjoy my time in the factory when I’m playing, doing something exploratory, inventing something or building a prototype , This is when I call the factory the toy shop. Anyway, I had reason to go into the industrial heartland the other day to buy parts for the latest kiln that I am creating. I have various accounts with companies that import fire bricks, stainless steel, burner parts, welding consumables, Steel sections etc. It is another world out there. They even speak another language, ‘Farkn’! I recently had reason to call in at Napolean Burner Parts for some simple stock items and found myself having to deal with fluent speakers of Farkn. ‘Farkn’ is a dialect of english or perhaps I should say a creole or pidgin variation of english, perhaps over time it will develop into a regional dialect or sub-language of Australian English? Who knows? It can also be gratuitously inserted into a sentence where it isn’t needed, except to show that you are familiar with the dialect and in this case it is used as a key to open up further dialogue in the dialect to form a rapport or bond with the other user. I am not a fluent farkn speaker, however when I am in the midst of a group of fluent farkn speakers, I can usually follow the gist of the conversation, although I do miss many of the finer points. This is principally because I have not studied any of the other dialects that are intimately melded into the farkn creaole mix. For instance I have not studied Rugby league, Aussie rules, V8 supercars, Interstste trucking, Motor bikes or beer. So because these other dialects/languages are not at my finger tips I often find that I cannot make the instant reply that is required to keep the conversation flowing. My speech is stilted because I have to translate as I speak, deciding what to leave out and when to insert. This is a result, I’m afraid, of a miss-spent youth studying art and practicing various craft activities. My only previous exposure to Farkn, was when I briefly volunteered to join the local bush fire brigade. In ’75 Janine and I were new to our village and because we had been burnt out where we had previously lived in Dural in a fierce bush fire before re-locating here, we thought that it would be a good idea to join the bush fire brigade and do our bit. With-in weeks there was a fire and the fire tanker/truck pulled up out side our house and blew it’s horn, we quickly ran out and jumped on the back of the truck with the other men. So ended our very brief career in the fire brigade. This is where I have lost track of the conversation, but because everyone is nodding agreement I feel that all is well and that my order for burner parts is being processed normally and I will be able to leave and return to my own isolated enclave quickly and safely. From this exchange I have come to realise that the boss creates his authority over his employees because of his extended vocabulary and I am grateful to him and his employees for their tolerance and patience in dealing with me as I am a FSL speaker. This is the 7th time that Mmlle Fifi and I have attended the Adelaide festival and in particular writers week and Womad. At Womad there are something like 20 to 25,000 people attending each day, so you can imagine the number of loos that are required to keep that number of folk comfortable. There are a number of sites where one can find relief in and around the Botanic Park, however the main site is the road leading along the edge of the Botanic Park. The road is closed off to through traffic and filled with semi trailers carrying shipping container sized portable conveniences, and this is the interesting part. There are twenty five trucks full of loos and twenty one of these are for the girls, four for the boys, still there are queues of women out side all the ladies, but none for the mens. As the days go on, we find that two more of the men’s are renamed and allocated to the girls. There are still queues outside the ladies and even a few desperate femmes a driven to take the risk and make that dramatic rush into the men’s with cries of warning. Finally we are left with a standing urinal truck only. This for some reason is not commandeered by the women. There are still queues in front of the ladies and none in front of the mens? Men file in and out on a regular basis while women stand hoping about on one leg and then the other, waiting. So what is the difference between men and women in their ablutions? Mmslle Fifi claims that it’s to do with access and clothing, but I can’t help but think that it might be worth trying taking the mirrors out of the ladies, it just might help speed things up for their own comfort? So here we are at the Writers Week event and the same issues are evolving. They take quite a spell in there. What are they doing, punctuating there ablutions with the write conversation? After all this talk of writing and letters, I watch and wait while Janine Qs for her P.
All my experiences have been percolating through me for the whole of my life and a mixture of the techniques that I witnessed and learnt during my studies are peeking through my own natural style. There is nothing quite like getting out of your comfort zone, learning to cope with the unexpected. We all have to. Indeed, everything has an effect on my work. Even if I’m not aware of it at the time, and perhaps don’t even want it too. I remember being terrified, running, screaming, she chasing me with grandmothers walking stick. Me running and running, was cornered and copped the thrashing. I remember crying uncontrollably. Heart pumping, deep sobbs. Body shaking sobbs. I never cried again. The next time, I toughened up. I took it. I didn’t make a sound. These days I collect rocks and I break them. I grind them down to impalpable dust. I apply these broken and powdered rock dusts to my pots as glazes and subject them to the heat of the fire. In the kiln, they are transformed, they melt, they metamorphose, and are reborn as subtle objects of beauty and desire. But the tears are still there. They weep from the stone. Everything has had an effect on my work. Even if I’m not aware of it at the time, and perhaps even if I don’t want it too. I have always been interested in living ‘lightly’. I am a member of the ‘Greens’ in Australia and have spent my life working for environmental causes. All my ceramic work incorporates this line of thinking and my lifestyle includes growing my own food, generating my own solar power, collecting and storing my own rain water, building my own house from local and recycled materials etc. So when it comes to building and firing a potters kiln, I chose to build my kiln out of home made refractories and fire it with wood grown on my own land or locally from garden prunings and fallen trees from storms. I utilise the ceramic materials that I’ve discovered around me in my local area. Through investigating my local geology I have discovered some unusual ceramic bodies and in this case in particular, a deposit of white bauxite refractory clay, which I have used to make my own fire bricks to build my kiln. I made a number of tests until I came up with a good recipe, on my 42nd attempt. I decided to utilise spent coffee grounds from my local cafe. By incorporating this recycled material into the mix, I was able to bring my naive, old fashioned working method a little up-to-date. Cafe culture and particularly coffee culture has become ubiquitous, so I felt that I needed to incorporate some of this contemporary cultural activity into my ceramic practice. By incorporating these used, dried, coffee grounds into my refractory brick mixtures, the tiny granules create very small air pockets in the finished firebricks which makes them more fuel efficient, creating a insulating refractory brick. Utilising my local ceramic materials has enabled me to develop my own unique quality of wood fired porcelain, proto-porcelains and blackware made from these unique native stones. The Essential nature of this endeavour is about a respectful interaction with my environment, with this locality. When I was young I wanted to believe that there were some absolutes in life. I wanted to believe that there could be a definition of such concepts as truth and beauty. As I’ve grown up and out, I’ve come to realise that there will not be any absolutes in my life (other than old age, incontinence and death – possibly taxes – I long for the day that I have a tax problem from selling too many pots). I have had to come to terms with the fact that good and evil, truth and lies, beauty and ugliness are all relative and coexist in each of us, all of the time. I accept this duality and embrace the angst that comes with the rejection of false certainties. Being brought up in a loosely Buddhist/Quaker household, I was probably the only 7 year old in my primary school who knew the whereabouts of the Dalai Lama, not that I thought that this was in any way important, so it should be no surprise that my first pot in 1959 was an interpretation of a Tibetan butter lamp. It’s amazing what kids pick up from parents conversations. Not that I knew much about Tibetan butter lamps, but it is quite interesting to me on reflection, that this is what I chose to make, sitting in the gutter of the dirt road in front of where we lived and picking out fresh wet clay from the gutter after a rain storm with my little friends. I suppose that it supports Loloya’s assertion that the man is made in the child before his seventh year. My mother kept that pot all her life and after her death, I discovered it amoungst her personal treasures, tucked safely away and so it came back to me and I still have it. At that time, In this family setting, it was not the pot that was important, but the activity of the making of the pot and the effect that the pot would have on the people who used that pot which was up for discussion and appreciation. Rachel Carson was the hot topic in 1962. 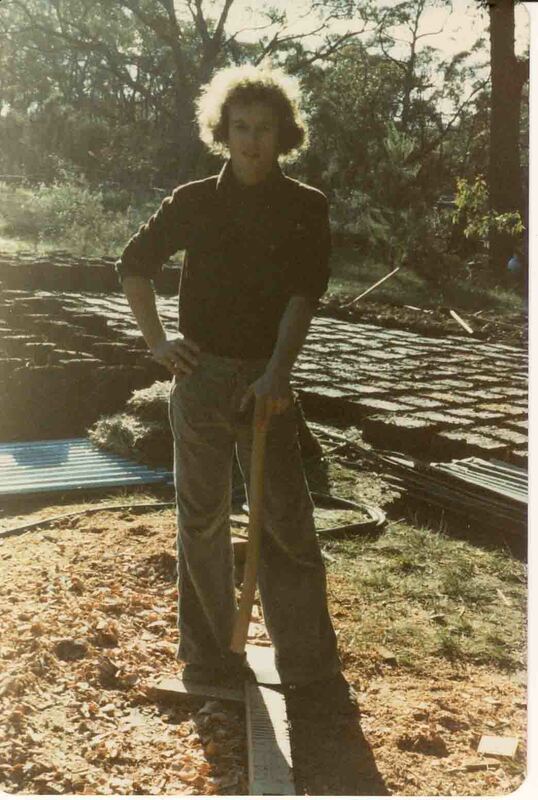 I was 10 and old enough to be expected to help shovel manure into the ‘turned’ compost heap for the large extended-family vegetable plot that fed us all. These events and others like them ground my cultural lens and set its focal length. So now when I think about firing my kiln, I first think how important it is to fire as cleanly as possible, as I would be the first one to be concerned if my neighbour were to create a lot of unnecessary smoke and pollution in his day to day life. I don’t see that being involved in a creative activity gives us some sort of carte blanche or ‘get out of jail free card’ to pollute. I also think about how I can use as little wood as possible while still being able to see that my pot is obviously wood fired. I don’t buy my wood from a merchant. I have a finite amount of energy, everything that happens here is facilitated by human effort. We however use machines. We are not luddites, but we are aware that everything has an environmental cost. I have an image of what I want to create, and I like the gently wood fired and flashed surface that I have been getting. I also think about the effect that the firing will have on others, my neighbours and finally myself and my family. Will these small bowls that I am making have any genuine useful place in society? I certainly hope that they will and to date, there has been a small market for this kind of creative work, albeit very small indeed, and through a Fine Art gallery system, but my methods are antiquated and quaint and Oh, so very slow, so my output is quite small. So far I don’t seem to have flooded my market. Globalization has resulted in a situation where we are spoilt by the availability of exceptionally excellent materials. The best of everything is available to us every day of the year. The seasons have been obliterated, every food stuff from where-ever, all the time, from all over the world, but at a terrible cost. I am trying to avoid, where ever possible, the near-criminal insanity of this situation. Nearly everything that I use is obtained locally, by me, by hand or personally operated machine, collected, crushed milled, blunged, flocculated and sun dried, here in this locality, on this spot. I know where my clay and glazes come from. I know where my food comes from. I eat what is in the garden in it’s season. My first kiln was a small low temperature wood fired kiln such as one might use for making raku style work. I dug my own clay from the gutter on the side of the dirt road where I lived. I’ve been doing all of this ever since. It’s just now that it is no longer a game, it’s real life and it’s remained fun, fun to experiment and to think “what if”? These days I fire to stoneware temperatures to create my native bai tunze porcelain. I have spent many years developing the concept of the down draught firebox, trying all sorts of variations. It’s really important to me to fire as efficiently as possible and as cleanly as possible to minimise my effect on the environment. I’m deeply committed to the integrity of this endeavour, to consume as little as possible, to be as resourceful as possible, to be self-reliant. In building my own kiln from my own firebricks in our own shed, made from local mud, fired with timber that we have grown ourselves on our own land, which has more trees on it now than it had when we first came here 35 years ago. All the waste rock glaze and wood ashes cleaned from the fire, if not used to make new glaze, is respectfully returned to the compost heap, where it is used to fertilise our organic garden. Today I’m much more selective about what I fire. I’m pleased with my home made, technically inferior firebricks. The down draught fire box heats my kiln easily and efficiently, without too much smoke. I’d like to say no smoke, but I can’t claim that, however, it’s minimal and mostly at the beginning, when the kiln and chimney are still cool. This small kiln fires in 14 to 20 hours, so I can fire it in one day without getting too tired. This design, where the ash is dropped into the falling flame from a height, allows plenty of ash into the setting to gently decorate the pots with a natural sprinkle of ash glaze. It reduces beautifully without any smoke, sufficient to create lovely soft grey carbon sequestration in the ground stone bodies and milled rock glazes. I don’t have to rake or flick the embers to get the ash up onto the pots. In some of my pots, there is very little difference between the clay body and the glaze This work is unique, completely authentic, respectful of the natural environment and as beautiful as I am able to make it and must have one of the smallest footprints of almost any ceramics being made today. I am not under any illusions, I am fully aware that I am only able to live this Jackals existence, scratching a living at the fringe of a wasteful and affluent society, while such a society exists. My life would be very much harder in a less affluent place. I also would not have been able to live this creative life without the respect and support of my life partner Janine King, also a potter, greenie and keen gardener. Thank you Janine! 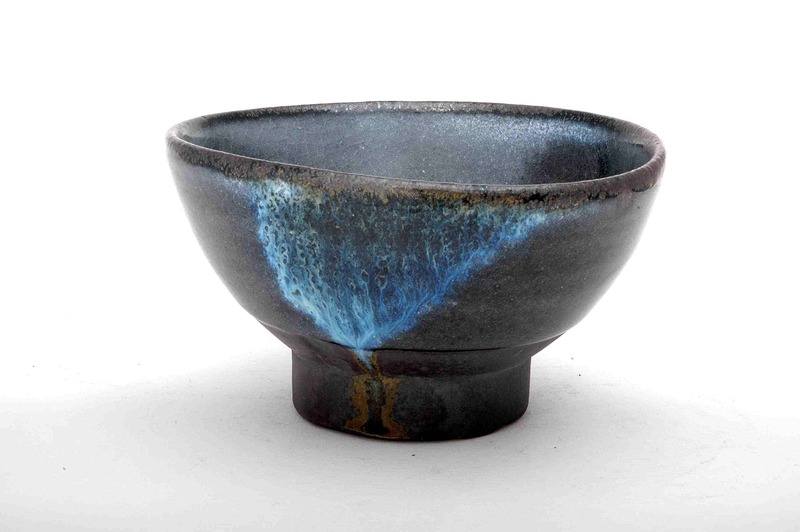 Dr. Steve Harrison trained at the National Art School in Sydney, Australia and completed an apprenticeship with Japanese Potter Shiga Shigeo, also an MA Hons and PhD. He has a life long involvement in the green movement and has been developing techniques using local materials for short, fuel efficient, clean burning, wood firing for over 40 years. He is the author of several books, particularly ‘Laid Back Wood Firing’, now in it’s 5th edition, which has been continuously in print for the past 35 years. The slow and patient development of this philosophy has been part of an exploration of how it might be possible to live frugally and gently in a faster, noisier and bigger world of seemingly senseless and excessive consumerism. I have been wondering if there is a way of living that can sidestep this rat race, or at least move to the much slower lane in the race to nowhere, trying to negotiate a niche at the bottom of the ceramic food chain. My Partner Janine King and I work in isolation, making the ceramics that interest us. We try not to get involved in anticipating or even following the market trends. We make only what pleases us and then try after the event to find a market for our work. This is not good business, but it is the most rewarding in terms of satisfaction. I work with the raw materials that I can find around me in my immediate locality and then try to find what I can make from them. I find this approach most fascinating and very rewarding. By teaching myself other skill sets like metal working and wood working skills, I managed to find my niche. I have been able to remain more or less self-employed on a part time basis all of my adult life. I have never had a full time job or salary. I have learned to be frugal and this has allowed me the freedom to live a creative life. I have a life partner who is also in the same position, so together we have worked to achieve independence on a very low budget. I am under no illusions. I know that I could not have lived this quality of life without either Janine as my partner, or by trying to earn a living solely through sales of my ceramics. It became very clear early on that I would need another source of income to balance my financial and creative books. I have tried many things to earn this creative independence, in the early days it was; builders labourer, plumbers assistant, bricklayer, welder, sheet metal worker. None of these jobs were ideal – far from it, but they were all part of my journey, they have helped make me what I have become. When I was young I thought that I might like to live in the country, to grow my own food to create my own life, build my own house, and I have now fulfilled all of these modest ambitions. Since I was a child, I have had an interest in the natural world along with drawing/art/creativity. I grew up in a fringe suburb surrounded by native bush and heath-land. As I wasn’t academically minded, I spent a lot of my time wandering in amongst the bush, rocks and bogs. Going down to the creek, looking for yabbies, collecting clay, spending time watching the wildlife, picking up stones and wondering what made them the shape, colour and texture that they were. Our indigenous peoples have a long tradition of respectful collecting, gathering and hunting. I feel that my small experiments interacting with the natural world are a contemporary continuation/interpretation of this ancient practice. In the 38 years since I moved to this small Village in the Southern Highlands south of Sydney. I have had a colourfull life, found lots of interesting and useful things that a potter needs, materials like red felspar, white bai-tunze, yellow kaolin, blue cobalt and green energy. I have become interested in aspects of the real, the tangible, the hand made, a sense of place, the ‘terroir’ of a locality. I have no interest in the fast track and the cheap throwaway. I want real things around me, things that will stay around me and develop a patina of age and a meaning born of context and familiarity. Some years ago, I discovered the ‘Joadja’ bai tunze native porcelain stone deposit amongst others. This has enabled me to develop my wood fired porcelain and proto porcelains made from native bai-tunze porcelain stone. The nature of the pieces that I have created is such that they represent the geology of the Southern Highlands. They are not the most translucent or the whitest of porcelains. However, they are the product of my interaction with my locality. During the development of this work it has been my intention to make a 100% local product. In this regard I have to admit that I have failed. However, this work is my attempt to produce a local product. With all its limitations and faults, and all its local character. The French have a word, ‘terroir’ that expresses some of this quality. The search for a personal aesthetic based on the essence of my locality is also the search for the essence of the potter. The two are inseparable. I like to think that my use of my found earths, stones and ashes to create individual pieces is akin to Hogwood’s use of period instruments to express something that is essential and fundamental to his art form. I am a ceramic lacavore, I like the recent idea of the 100 km diet, and likewise I have chosen to limit myself to the 50 km palette. All of the wood fuel for my kiln was grown on my own land, my neighbors or from local garden prunings and wind falls. I made the fire bricks for my kiln by hand, from a local refractory white bauxite clay. My glazes are made from the same bai-tunze porcelain stone as the clay body or other local igneous rocks, shales, gravels and ashes, all discovered by me and then crushed, processed and milled in my workshop inefficiently, on a very small scale. All this happens in our workshop, a workshop built by my partner Janine and myself from mud bricks that we made from local clay. We have an extensive organic garden and orchard which provides most of our fresh food throughout the year, so our energies are split between our efforts at ceramic and food self-reliance. In recent years we have installed solar photo-voltaics sufficient to power our house, workshop, electric kiln and factory. Because we have learnt to become very frugal in our energy use, we find that we are able to not only support all our electrical needs, but we also have enough power in excess, so that we can sell more than half of our output back to the grid each day. This is the life that we have been working towards all our lives and although it’s not perfect, we feel that we have achieved a low impact, soft footed, carbon neutral way of coping as potters in a modern world. Someone once asked me what was left on my bucket list. I answered that I haven’t learnt to make buckets yet, but once I do, that will be the first thing in there. What has happened to our sense of an independent Australian identity, our sense of community and our corner shops? Things are changing – as they always have. We find ourselves in an era globalisation, of shallow consumerism, apparently comfortable wealth in a material sense, but we find that we have never been poorer in time and quality of life and deeply in debt to boot. We seem to be loosing an awful lot to pay for this excess of shallow and meaningless consumerism. Can we really lead a life where a container load of cheap junk replaces one or two good objects? It seems so. My response to this cascading consumerism has been to immerse myself in living a hand-crafted life, intentionally creating imperfect objects as an antidote to this avalanche of cheap plastic. I have found that I have had to disengage from this culture of excess and develop a philosophy of minimum consumption. My work is the result of many years of research. I really enjoy fossicking around in my immediate locality. I have found all sorts of interesting ceramic materials. Unfortunately I haven’t found good white plastic clay suitable for throwing vigorous lively pots on the potters wheel. But never mind. I have come to realise that there are many other interesting approaches to making a wonderful pot. Some years ago I stumbled across a very small, dense, and extremely hard deposit of rock which could have been a white felspathic igneous stone – but that only happens in the movies, so I didn’t believe what my eyes were telling me. I was told when I arrived here in this district over 30 years ago that there was no white igneous felspathic rocks in this area. It was potters knowledge, a known fact! Consequently I didn’t bother to test this sample straight away, because I knew intellectually that it couldn’t be felspathic stone. Only when I had tested every other sample did I get around to this amazing rock. Of course I only tested it as a glaze material, it was just so hard and dense, it needed to be broken down in a jaw crusher, then reduced further in a disk mill and finally ball milled for 16 hours for it to be reduced to a fine powder. It turned out to produce the loveliest Guan/pale blue celadon although very matt and viscous and quite crawled. This crawling intrigued me, if it was crawled, and crawling is often associated with plastic materials, perhaps this apparently hard, non-plastic rock could have some plasticity? I quickly mixed up a small batch of ball-milled powder with some water and kneaded it to a stiff mass, miraculously it was almost throwable into a very thick walled, small, uneven bowl form. 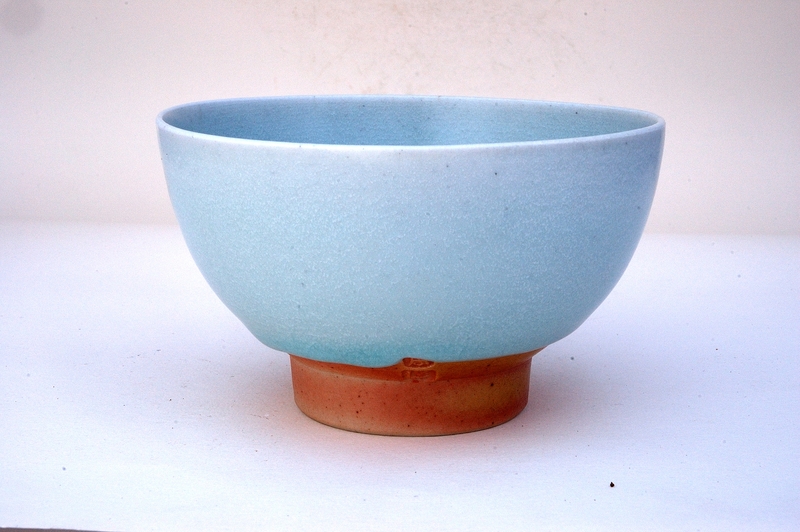 I glazed it with the pale blue celadon glaze made from itself and to my total amazement it transformed itself into a translucent porcelain, even though it was 8 mm thick. So this is one of the ways in which porcelain can be discovered – simply by being inquisitive! This porcelain isn’t the whitest, or the most translucent, but it is my porcelain and it is completely local. I could not have imagined that I could discover a white felspathic porcelain stone or ‘bai tunze’, as the Song Chinese called it, but I did and it only goes to prove the old adage that ‘the harder you work, the luckier you get’. I now add some bentonite to the mix, which is not local, but it is Australian, and this helps the plasticity along somewhat, but careful ageing for a few years does the same job. I can only make very small items with this material and they need a lot of turning to thin out the base, which needs to be left thick on the wheel to help support the wall, due to the almost total lack of plasticity, but these are minor limitations. I have been able to make what I think are some very lovely bowls by this method, by only using what I find around me, seeing what it can do and then using it in its own way to express something that is unique to this locality. These things can only happen here. They are not great things. In fact they are not even noticed or valued by almost anybody but me. But they are important to me because they can only be done here. If I lived somewhere else, I’d be making different pots. I have since discovered a very beautiful matt black clay body that is just as unlikely and impossible. I didn’t know that a clay body like this existed until I stumbled across it. I wasn’t looking for anything in particular, just doing research for the sake of it. I always travel with a few plastic bags and a garden trowel in my car – just in case. On this occasion I happened to come across some rotten basaltic gravel on the side of the road, where it had washed down from the road cutting. It was completely non-plastic, so I tested it as a glaze material – because that’s what I always do as a starting point, but because I’m the person that I am, I also tested it as a potential clay body. The glaze tile was awful, black/brown, matt, dull sludge. Not too surprising really, but I still persist in testing just in case. 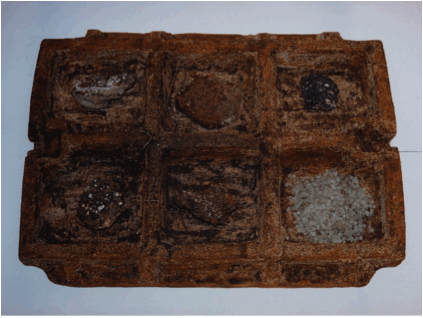 In this case the clay test was initially less encouraging in the first instance. The gravel just sank to the bottom of the bucket and very little clay was released from the rotten gravel. No surprises there, but there was some discolouration of the water, so I persisted. Vigorous stirring resulted in an increase in the discolouration of the water. Left to soak overnight and then re-stirring resulted in a very thin, watery slip. When I sieved out the gravel through a 100# mesh lawn, approximately three quarters of the original gravel remained on the screen. This could not be more in-efficient, but I don’t make work like this for the money. The result after stoneware firing this washed gravel body was a stunning dense, matt, black surface that brings out some very rich and beautiful effects from my local stone glazes. I was attracted to the intense blackness of this iron rich washed rock body. It was black, Rothko black, as black as Churchill’s dog. The blackness suited my mood at that time, a period of intense introspection, from which emerged some lovely dark pieces, lifted by the use of paler pastel glazes made from my white porcelain stone and ash, all liberated from my local environment. Ground rock dust or washed gravel silt aren’t the most promising materials to work with, but apart from the limited plasticity, which restricts the scale and form of the pieces, there are many fine qualities that these materials exhibit when wood fired. I am particularly fond of the intense red and orange flashed porcelain body colour. Flashed porcelain isn’t all that common, it intrigues me that it can still be translucent and when coupled with the right glaze, it can be sublime. Some of the ground-up rock and washed gravel ‘clay-like’ bodies that I have used have been aged for at least 4 years, because like good red wine, the working properties and marginal plasticity of these milled-rock-dust clay bodies improves with time. Eventually they can be thrown, but with some difficulty, so look who’s throwing stones. I have been working with these materials that no one knew existed, including me until I stumbled upon them by sheer persistence and some luck. My work involves the hand selection of the stones, their crushing, grinding and eventual reforming to produce these unique pieces. 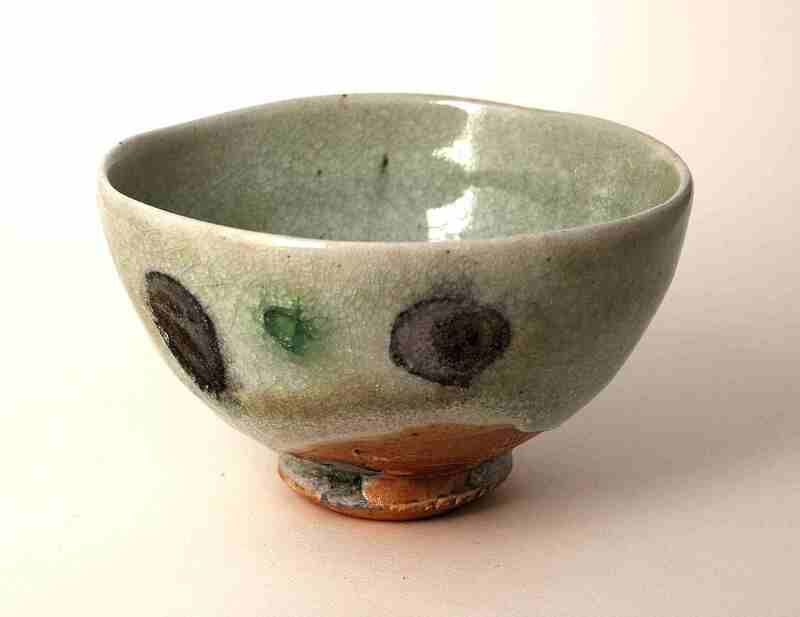 Likewise the glazes are all created and fired using the same creative research and attention to detail. Simple stones, ashes, clay and lime can be transmuted to soft pastel translucent colour with the hardness and durability of porcelain. Recent middle class life in the western world has created the expectation of ‘everything on demand’. As viewed through our cultural lens we have been lulled into the false expectation that everything in our lives can, and will, be perfect. We lead perfectly controlled lives. However, modern life has been reconstructed to make us all feel less secure, from the threat of terrorism to new short-term employment contracts. We are encouraged to fill our lives with 4 wheel drive loads of trivia to keep us too busy to think about the utter meaninglessness of consuming far too much of what we don’t need, only to replace it with something identical in a different colour, and it is all done on credit as if tomorrow will never come. On the other hand, I have taken years of concentrated research to make these bowls, selecting only the most unique and individual pieces that express my desire for individuality and otherness. I am surprised that no other potter that I am aware of is making work with a similar thesis to mine. These pieces are like no other, in that their specific provenance is known from their source in the earth to their ultimate exhibition in the Gallery. The recent trend towards minimalist white ware in ceramics is possibly a desire to consume more of what could be seen as somehow being “less”, in the sense that it is plain and undecorated whiteware. This may be a reaction to the over-consumption of too many unnecessary attention deficit distractions and clutter. I don’t believe that this anorexia of design in modern mass production and marketing is expected to fill any long-term need in the consumer, but is only the next step in the inevitable journey of perpetual consumption. My friend Chris James, a ceramic artist and creative thinker, has observed that; The structure and pace of modern life leaves us with no time for anything other than a ‘quick fix’, with a ‘who am I’ short course and a “de-tox” diet rather than to closely examine the foundations of our life as a whole. By living my low-key, minimal consumption, small life of modest ambition, where nothing is thrown out until it is worn out and where everything possible is made and/or repaired at home has allowed me to think of a different way of working, and a different way of living and this involves growing all of our green food., building our own house and furniture. I even built my own truck body from recycled alloy. None of this work is done efficiently, but it is done with a minimum of cash, relying heavily on recycling and making do. If you can create a life which involves less cash expenditure, then you don’t have to go out to work, you can survive with less or no debt. This approach has allowed us to live a more creative, low impact life. Making do with what is around me is a creative challenge as great as any other. Throwing stones is just one way of achieving this. I’ve been looking for a life outside the norm with a small foot print and through my work and by these means above, I think that I might have found it.